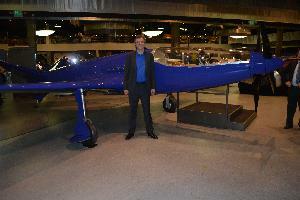 Patrick Meney was elected President of the "Club Bugatti France", saturday 6 december, in Paris. The French Bugatti Club has 260 members and will organize next june, the "2015 Bugatti International Meeting" in Provence (90 Bugattis from 17 countries, during one week and 1000 miles). 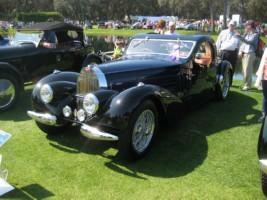 Patrick Meney is a 66 year old lover of vintage cars, and especially of Bugatti, since his childhood. He is well known by the french classic car enthusiasts, owning a convertible Bugatti Type 57, and a number of pre-war cars (Lorraine-Dietrich, Hotchkiss...), and a few cars of the sixties (E Type, XK120, MKII...). Outside his passion for vintage cars, he is a journalist (former war reporter for AFP), a writer well known in France, and a TV producer. 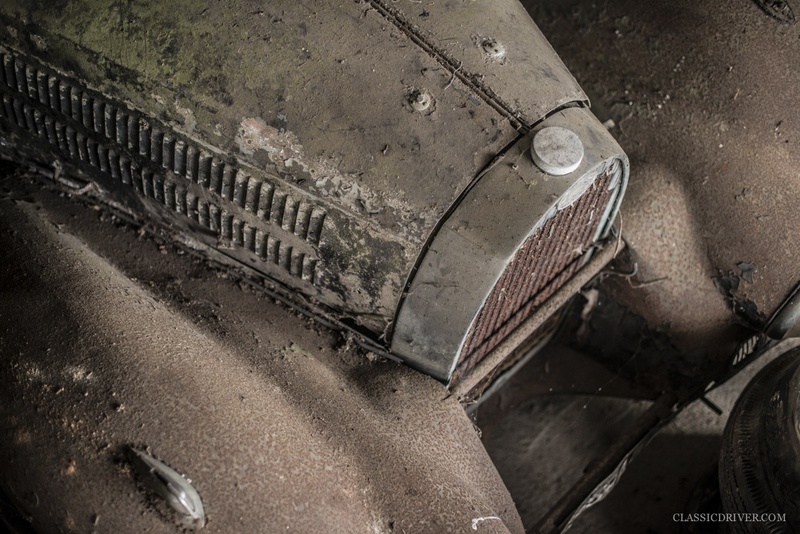 December 6, 2014 Bugatti T57 Ventoux amongst huge barn find in France: Collection Baillon ! The German on-line magazine came with the scoop yesterday, amongst the 60 cars there are some pretty impressive ones! Yes, it is still possible! Exclusive: Treasure trove of 60 barn-finds includes ‘lost’ Ferrari 250 GT SWB California Spider “Never again, anywhere in the world, will such a treasure be unearthed,” says Pierre Novikoff, motor car specialist at Artcurial auction house. 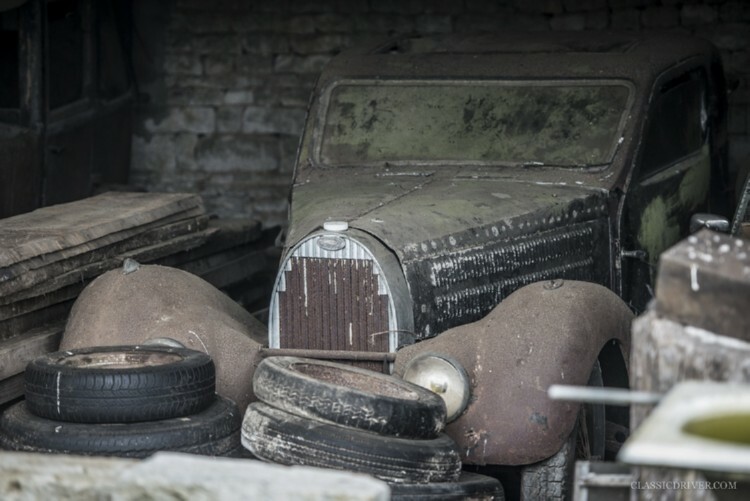 He’s describing a staggering collection of 60 barn-find cars that have been discovered after lying hidden for 50 years. 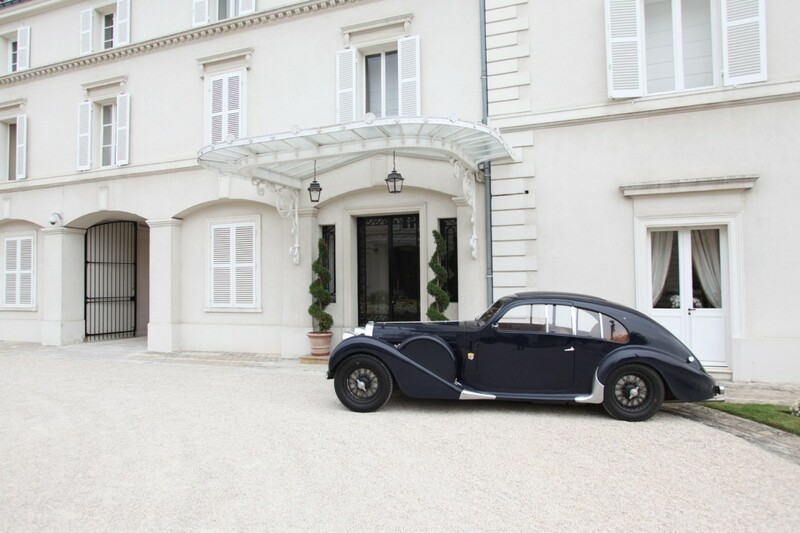 It all began with the grandfather of the family that currently owns the collection: back in the 1950s, he dreamed of conserving the heritage of pre-War cars in museum surroundings, focusing on the great French brands and famous body shops. This gentleman was an entrepreneur with a transport company in the west of France and he was a serious enthusiast: he even exhibited a roadster that he’d built himself at the Paris Motor Show in the 1950s. Sadly, during the 1970s, his dream fell apart when his business suffered a setback and he was forced to sell some 50 cars. After that, the rest of the collection stayed totally untouched, all these years, until its very recent discovery. …a Ferrari 250 GT SWB California Spider, with covered headlights, a car whose first owner was comedian Gérard Blain. 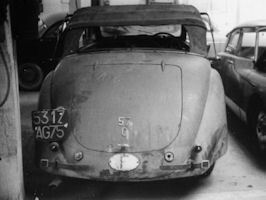 But according to Artcurial, the intriguing history of this – surely the last barn-find California SWB Spider ever to be unearthed – doesn’t stop there. 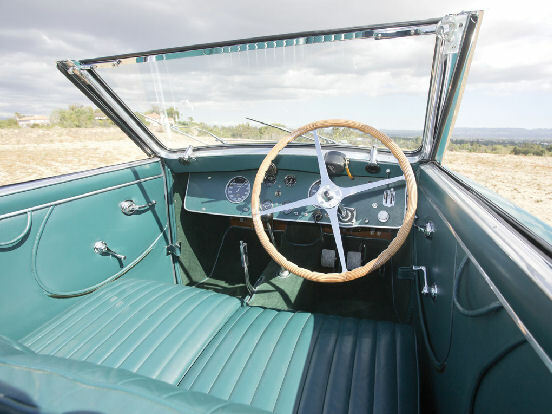 Blain sold the Ferrari to actor Alain Delon, who was on several occasions photographed at the wheel – accompanied, in 1964, by Jane Fonda (during the filming of ‘Les Félins’) and later by Shirley MacLaine on the Côte d’Azur. 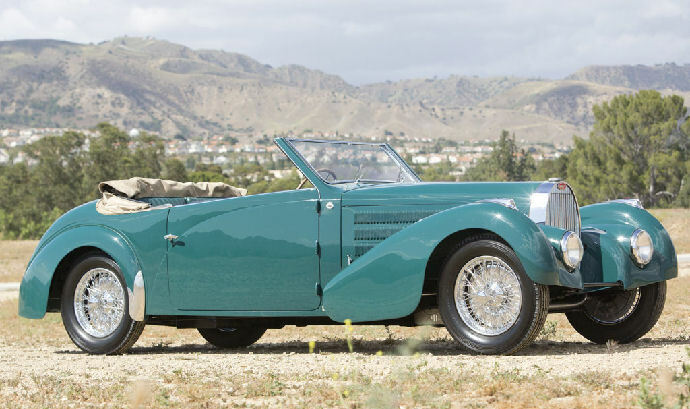 Even the wife of the original collector didn’t know whether he’d sold the California or still owned it, and their children knew nothing about the car until they came across it, a few months ago, hidden under those old newspapers. So it’s hardly surprising that the whereabouts of this important, Pininfarina-designed cabriolet have been – until now – a mystery to marque historians. What a discovery: and it’s hard to guess at the sort of interest it’s likely to generate among collectors. Fortunately, we won’t have to wait long to find out, as the California Spider will be offered – along with the other 59 cars in this amazing collection – by Artcurial Motorcars in the first part of its traditional auction at the Rétromobile Salon, on 6 February 2015, in Paris. Photos: Rémi Dargegen for Classic Driver © 2014. 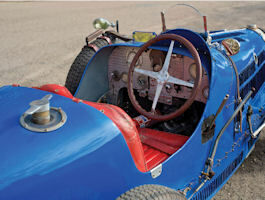 The original article in ClassicDriver.com, with of course many photographs! 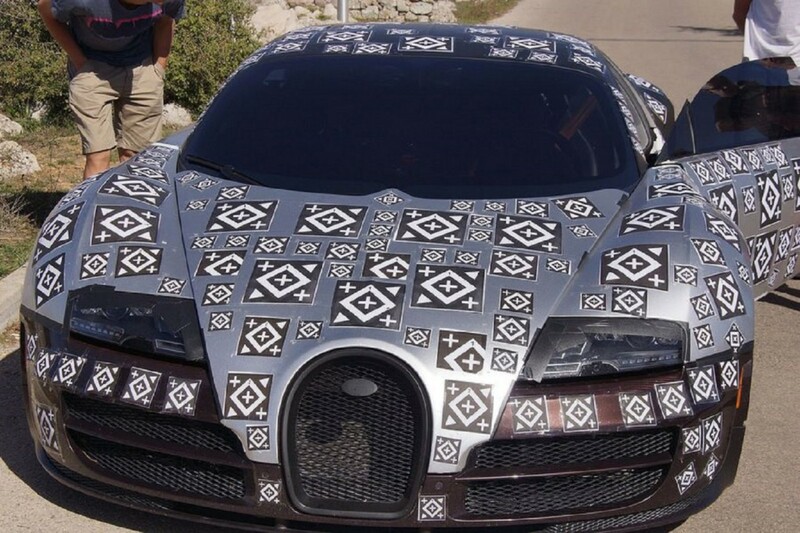 November 23, 2014 Scoop or rumour, the new Bugatti Chiron! As the end of the Veyron production is getting near, there are more and more news items about the next Bugatti. 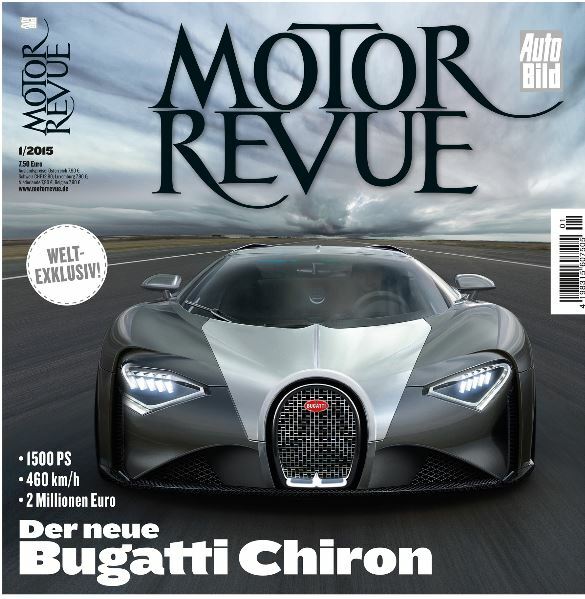 The German magazine Motor Revue announces that the next Bugatti will be called "Chiron". 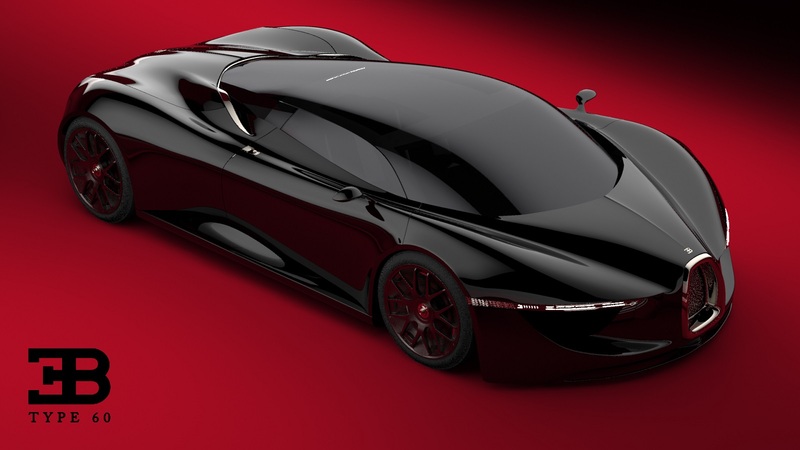 The production car, most expensive and most powerful automobile ever, will be produced from next year. The Bugatti Chiron will have a top speed of 460 km/h. The transmission will be by DSG seven speeds like the Veyron, and a maximum torque of 1500 Nm. A novel injection system will ensure that the car will meet the antipollution Euro 6 standard. Sorry, only one day left! 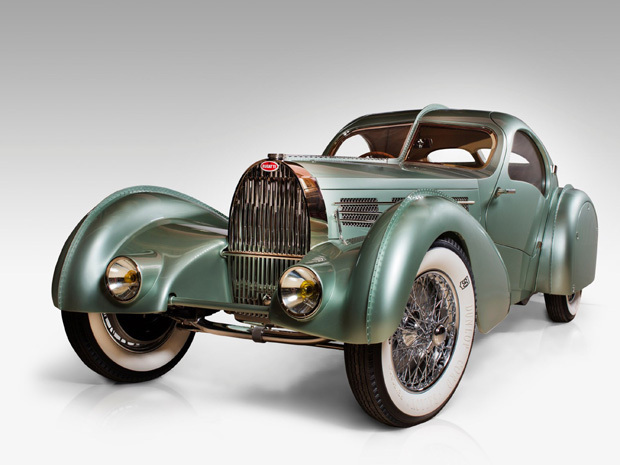 The avant-garde streamlined design of Jean Bugatti's 1934 Type 57 perfectly represents the marriage of aesthetic sensibility and engineering skill for which the company was famous. The Autorail railcar, the brainchild of Jean's father Ettore, was equally revolutionary. 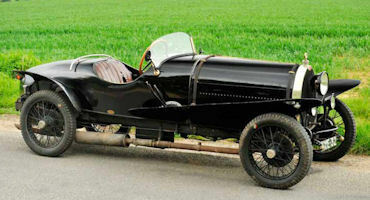 Powered by four Bugatti petrol engines each producing 200 hp, it was capable of 200km per hour on standard gauge track. The first prototype dates from 1933 and they went into service with the French State Railways the following year. 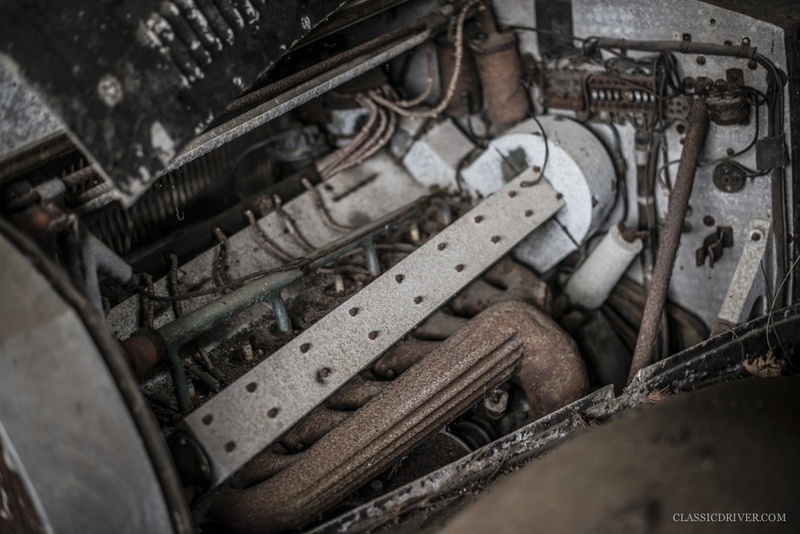 There are interesting photographs of the AutoRail, and various of engine parts, quite artistically photographed! 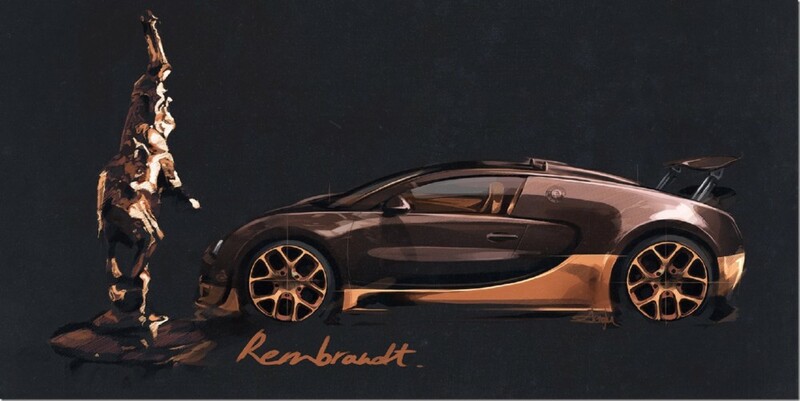 Bugatti design studies, often by design students, are presented often, and this "Type 60" by Vaughan Ling is no exception. The artwork on the Matchbox 1:32 kit looks very similar to this one, but is not exactly the same. Leake Auction Company will sell a 1934 Bugatti Type 51 Grand Prix this November in Dallas. It was consigned from the John Ridings Lee collection and will be a part of Leake's Platinum Series of cars, set to cross the auction block in Dallas Market Hall on Saturday, Nov. 22. 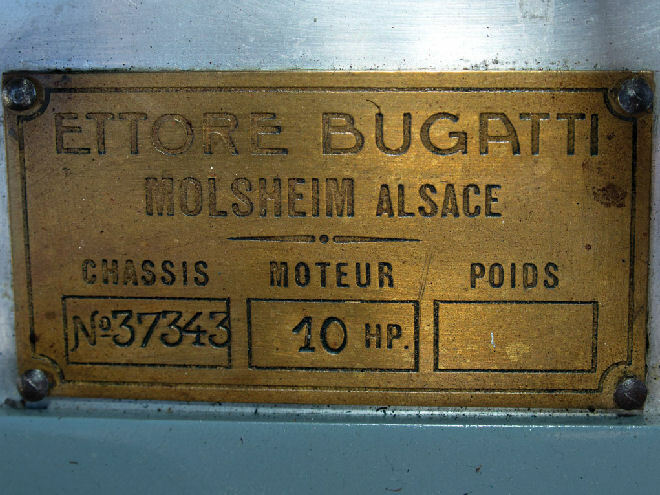 People have had a fascination with the Bugatti brand since 1901. 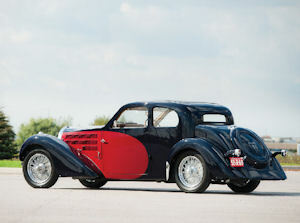 Only 40 Type 51's were manufactured between 1931 and 1934, making this Bugatti extremely rare. 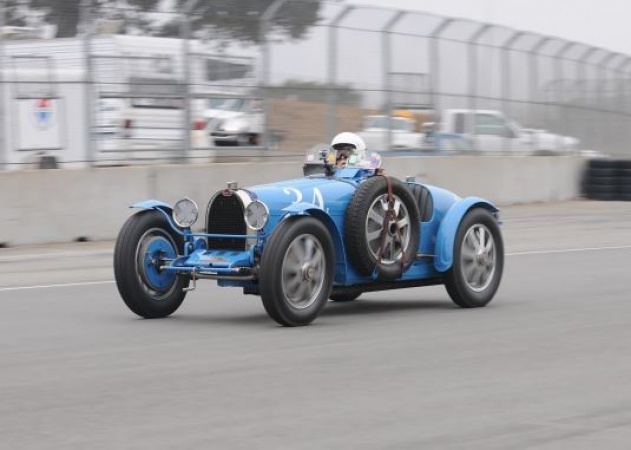 Carrying chassis number 51153, the Bugatti was purchased by one Mr. Lee in March of 2012 from Peter Mullin of the Mullin Automotive Museum in Oxnard, Canada. 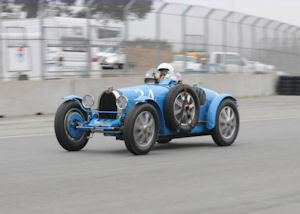 It has been raced at the vintage car races at Mazda Raceway Laguna Seca. The Bugatti has a manual transmission with twin overhead cam supercharged straight 8 Grand Prix engine. 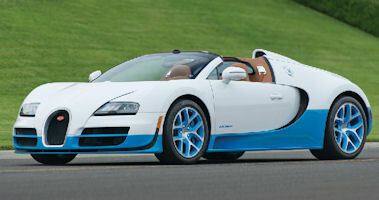 The exterior color is in Bugatti Blue with black leather interior. Fiva Identity Card which was issued to the Bugatti in April of 1998. The historical vehicle identity form, which was conducted by Federation International DE Automobile. A letter from David Sewell (Independent Bugatti Consultant) written to Peter Mullin on September 15, 2003 which attests to certain facts pertaining to the automobile. A historical report on Bugatti Type 51 Chassis #51153 by David Sewell. A report from Donald Koleman prepared Feb. 24, 1994 denoting certain historical pieces of information about the car. 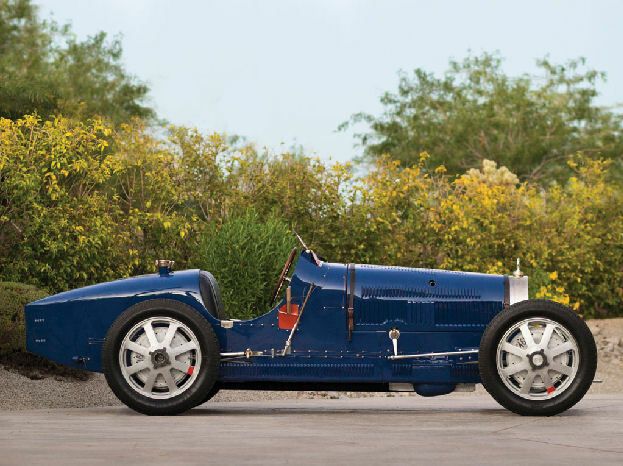 A report from Sandy Leith, registrar, American Bugatti Club, and an article written by Thor Thorson which presents an insightful profile on the car. 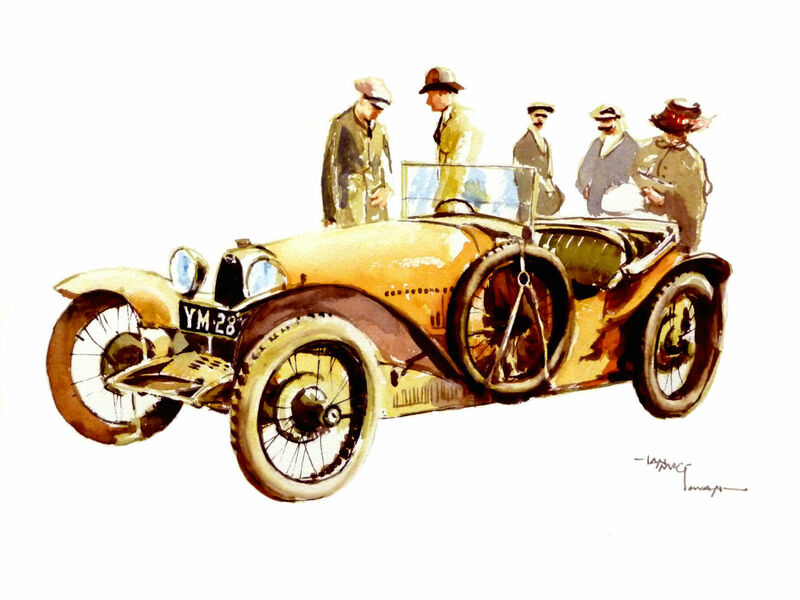 Well-known British illustrator for books, magazines, prints and product art in watercolour and line and wash.
Exhibit of 17 of the most beautiful Concept cars of all time, including, of course, the Bugatti T57 Aerolithe (Replica). Chosen from hundreds of concept cars produced between 1932 and the present day, the visions for these automobiles are exciting to behold. Like most concept cars, those on display were never intended for production. Imagine an egg-shaped electric car, an exterior surface made of flexible fabric, or a jet fighter rolling down the highway – all of these were among the ideas dreamed up by designers and are featured in these galleries. The "dream" represented by these cars was that of future possibilities and pushing the limits of imagination and design. 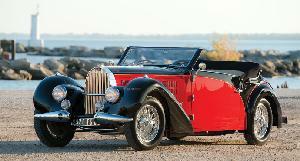 This Type 57 was delivered new to a Bugatti dealership in Lyon, France. 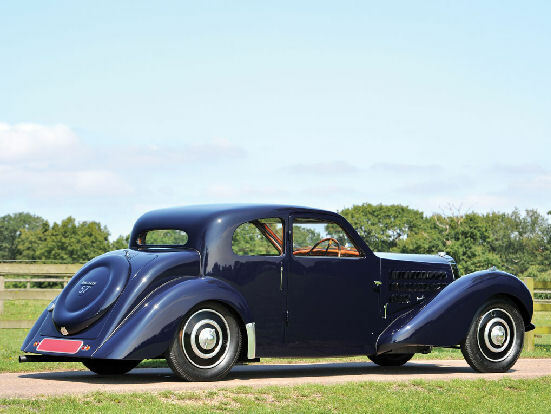 It was constructed by the factory in Molsheim with a supercharged engine, as denoted by the suffix “C,” and it received Gangloff coachwork, as documented in Barrie Price’s Bugatti 57: The Last French Bugatti. It was purchased new as a replacement for a naturally aspirated Type 57 drophead by the d’Aubarede brothers, Jean and Paul, who resided in Lyon. It was later registered in the department of Rhone under plate number 4090 PF 9. The car remained in their possession until at least the beginning of 1939, as noted by factory engine work that was performed on behalf of the brothers in January of that year. 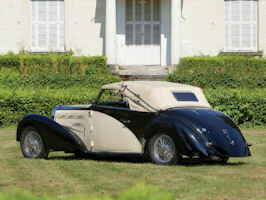 According to research compiled by noted Bugatti historian Pierre Yves-Laugier, the car was reportedly requisitioned from the d’Aubarede family for use during the war. After the war, in 1957, the car was found, still registered in Lyon with plate 3644 Z 69, by Henri Malatre. It was later purchased by famous Bugatti hunter Jean-Louis du Montant, of Eymoutiers in western France, and according to H.G. Conway’s 1961 Bugatti Register, it was painted light blue. 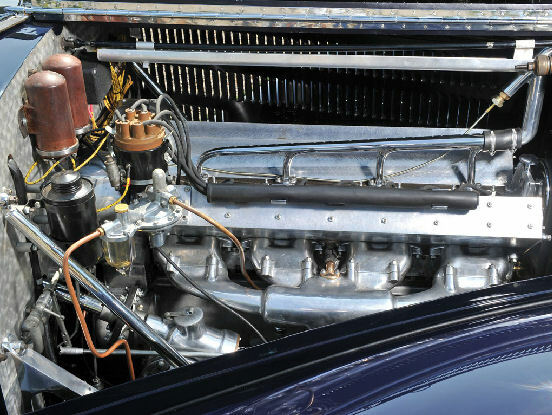 Around this time, it is believed that chassis 57597 received the supercharged engine that it retains today from another Type 57, chassis 57809, and the engine was numbered 82C. 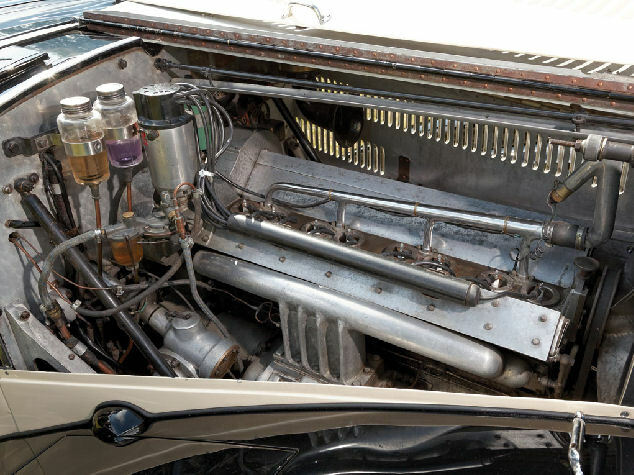 In May 1963, the car was purchased from du Montant by Dr. Richard Roger, a cardiologist in Southern California, who also owned a pair of Bugatti Type 49s. Dr. Roger kept the car for the next 15 years, before it was purchased in 1978 by Gary W. Tiscornia, of Milford, Michigan. By this time, the Bugatti was in rather tired condition, and he commissioned a full restoration by Bob Lorkowski at L’Cars Corporation in Cameron, Wisconsin. Renowned California Bugattiste O.A. 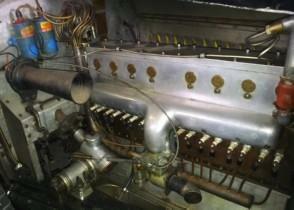 “Bunny” Phillips was tasked with sorting the mechanical work. Tiscornia chose to finish the car in an eye-catching teal-on-teal color combination with a light tan convertible top, which it wears to this day. 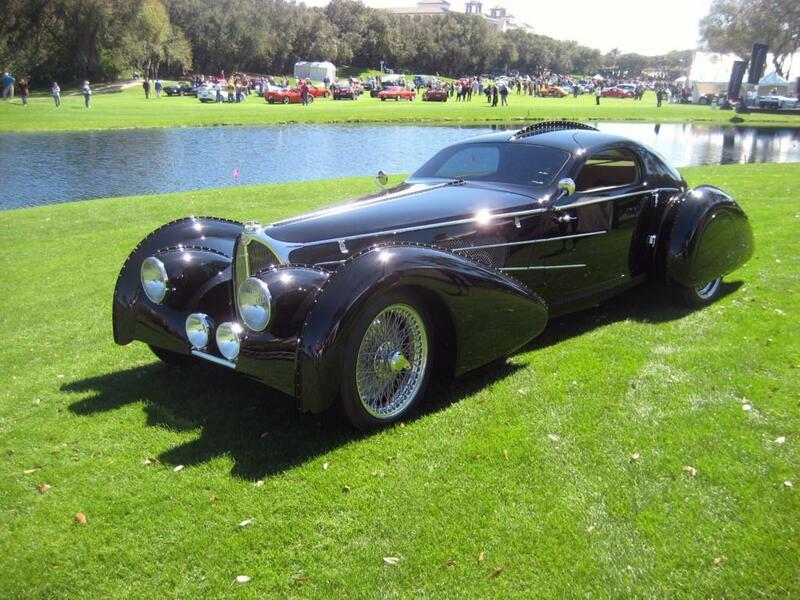 The restoration was completed in 1988, and the car was invited to the Pebble Beach Concours d’Elegance in 1989, where it proceeded to win its class. Under his ownership, the car scored 100 points at CCCA events three times, in Michigan at the 1989 CCCA Grand Classic, at the 1990 annual meeting, where it was awarded Senior Premier status, and in Minnesota in 1990. After owning it for almost 25 years, Tiscornia finally parted with the car in 1999, after many years of ownership and concours awards. The following year, chassis number 57597 was acquired by Bob Pond in September 2000 from the Blackhawk Collection, as is evidenced by a Bill of Sale included with the car. 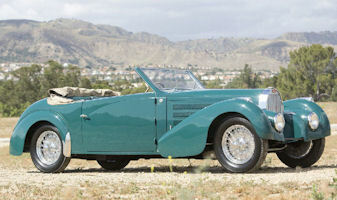 During his ownership, Pond showed 57597 a few different times, including at the 2009 Desert Classic Concours d’Elegance in Palm Springs, California, alongside his Delahaye and Tucker, proving the quality of the car’s restoration. It has been well maintained and preserved as a part of his collection ever since. There’s no question that the Bugatti 57C Stelvio is one of the most elegant and fashionable cars of its era, as it beautifully combines coachbuilt style with an engine developed from racing pedigree. In terms of Bugatti road cars, Type 57s of any body style have always been exciting vehicles to admire from both the exterior and interior, and they certainly don’t disappoint on the road, especially when fitted with a factory supercharger. This particular Stelvio boasts an interesting history that spans both the United States and France and is topped with winning Best in Class at the famed Pebble Beach Concours. The car’s restoration has held up well, and it would certainly attract lots of attention wherever it goes. Two questions: Why less than 3000 miles? Is the car so bad? And: With only 3000 miles, why does the car already need service? 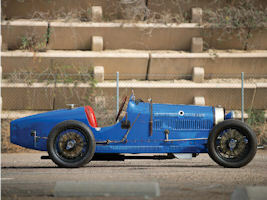 The history of Bugatti chassis number 981 has been well tracked by respected Bugatti historian David Sewell. Sewell notes that factory records show this chassis and engine number 538 as having been completed as a Type 23/27 with a 2,550-millimetre wheelbase chassis and a 16-valve racing engine on 2 August 1920. It was then invoiced on 14 August and shipped on 5 September 1920 to Louis Pabanel, of Paris. 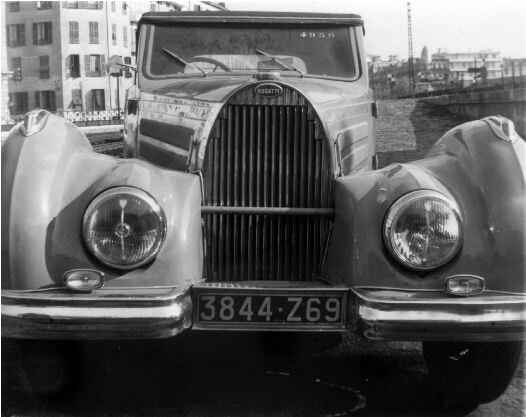 Per a contractual agreement between Pabanel and Bugatti, this was one of about fifty chassis marketed by the Parisian as Diatto-Bugattis, as they featured rectangular Diatto radiators and firewalls. By June 1922, the Diatto-Bugatti was registered in Marseilles, France, as 2775 M 2, a number which it retained after relocating to Draguignan in September 1926. On 16 October 1928, it was sold to Edmond Autran, of Toulon, France, who registered it as 291 YU. The last known French owner was named Pesnin. 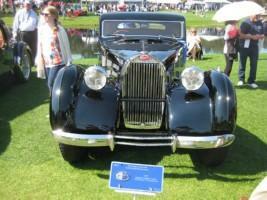 In the early 1960s, the Bugatti appeared stateside in the ownership of Weerte Ley, of Cleveland, Ohio. 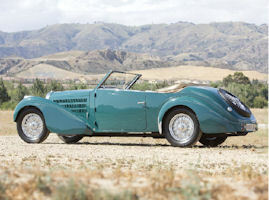 A decade later, it was acquired by renowned “ferreter” of old cars Ben Paul Moser, who listed it in the 1978 American Bugatti Register as a Type 22/23 with a two-passenger roadster body and wings, but no registration number was recorded. By 1989, the car had made its way to Japan, where it was owned by renowned collector of vintage sports cars Yoshiyuki Hayashi, who listed it in the Japanese Bugatti Register in 1995. Later that year, the car returned to the U.S.A., where it was owned by Rick Rawlins and Leo Keoshian, the American Bugatti Club archivist. 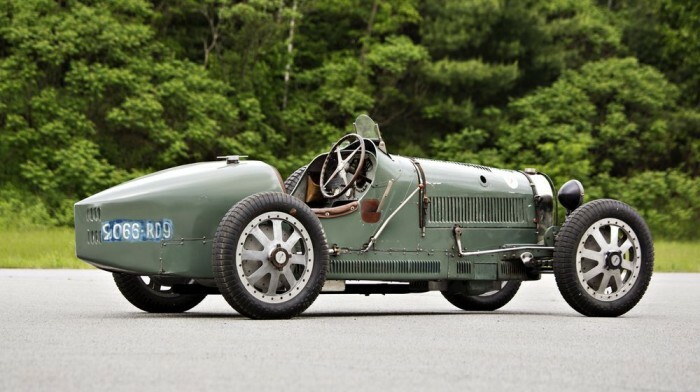 By the time of the car’s arrival back in the United States, the Bugatti had its chassis frame shortened to Type 13 specifications. 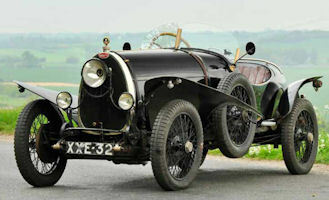 Sewell nonetheless noted in a letter to the current owner in April 2013 that the car “has an original Bugatti chassis frame which is unquestionably that of chassis number 981 produced in 1920. 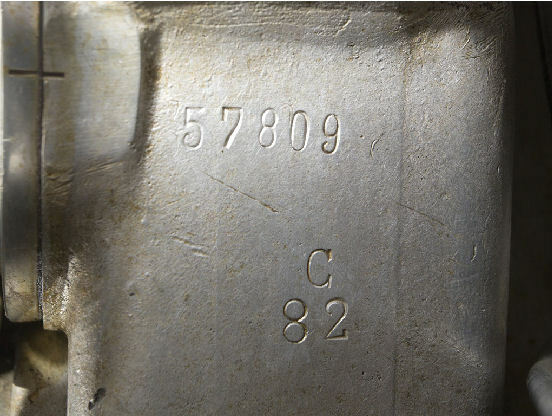 Its engine is equally unquestionably engine number 538, which is the original fitment to chassis number 981, as confirmed by the factory records. Furthermore, it is fitted with gearbox number 488, which the same records confirm was the original to chassis number 981”. 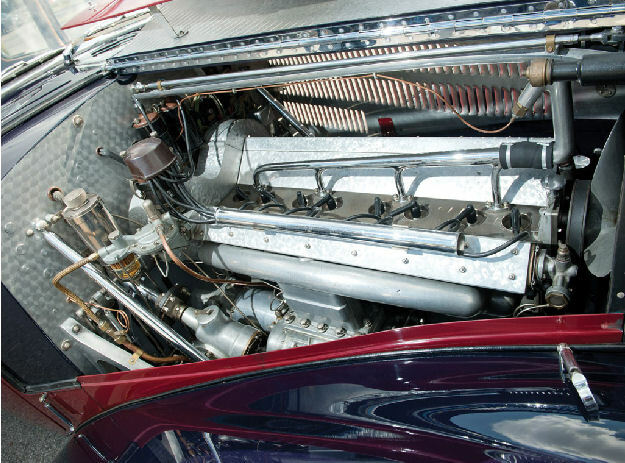 The engine was rebuilt for Mr Keoshian by David Wallace, of Phil Reilly & Company, the renowned Bugatti facility in California, and during this process, he used the original block with improved internal components. A new racing body was crafted by John Buddenbaum, which was upholstered in genuine elk hide and decorated with period motoring badges and a large hand-painted “13”, recalling the Type 13 that secured an important victory at Brescia. It is in this form, modified but unquestionably highly authentic, that the car is offered today. 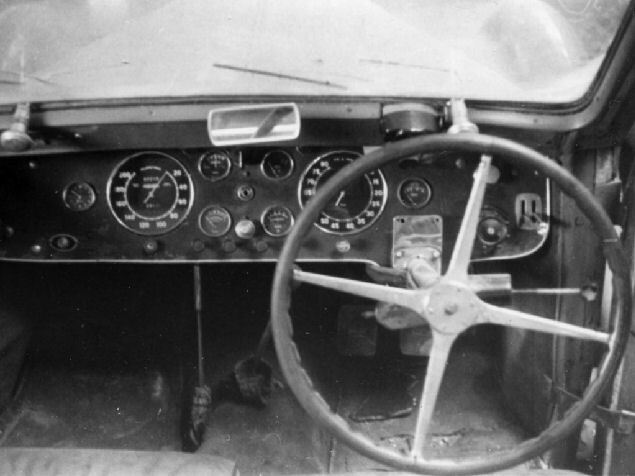 This is also the form in which Mr Keoshian drove the Type 13 extensively, participating in Bugatti rallies throughout Europe and in the United States and even racing at the Monterey Historics on six different occasions! 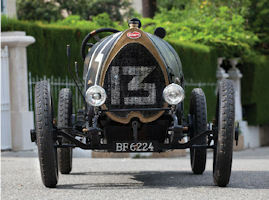 Continuing that tradition, the current owner has received its FIVA Identity Card and has taken advantage of it to participate in the Mille Miglia Retrospective in May 2013. 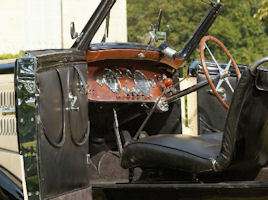 It would undoubtedly be an absolute thrill to drive on any number of other vintage motoring events all over the world, with its bare-bones, open-air carriage providing wind-in-your face, elemental thrills. 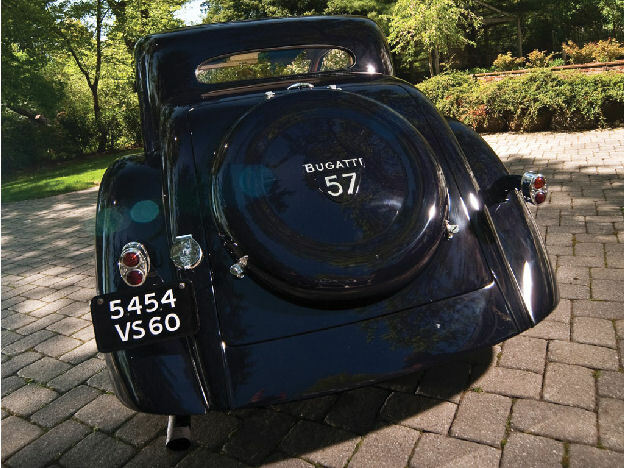 According to noted Bugatti historian Pierre-Yves Laugier, chassis number 57701 was assembled in June 1938, along with four other Type 57s and five Type 57C chassis. 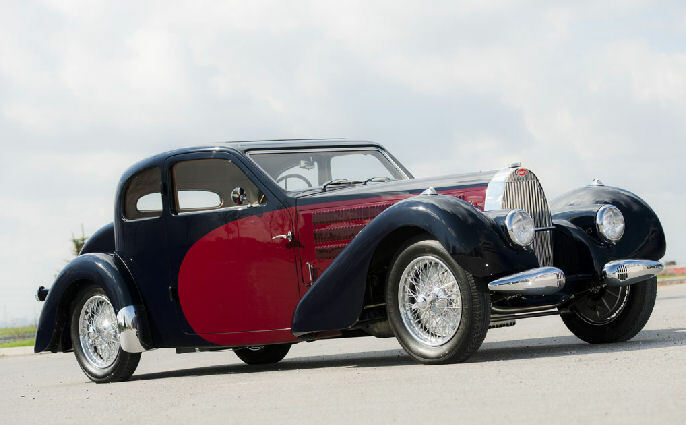 It was approximately the 30th Ventoux built since the beginning of 1938, and it was one of six originally finished in blue and the only one to feature a blue leather interior. 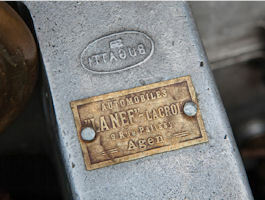 It remained in the ownership of the factory for three months before being sold, and according to Laugier, it was “obviously used by the factory” during that time. The original owner was Jean Sechaud, of Geneva, Switzerland, who officially took delivery late in September 1938. Sechaud, a Bugatti agent, was able to get a 20 per cent reduction in price, and he may have used this car as a demonstrator for the “Mercredistes”, the Sechaud clients who met every Wednesday in a Geneva restaurant to discuss their favourite automobiles. 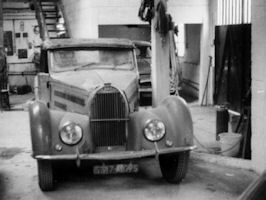 After World War II, Sechaud’s Ventoux remained in Geneva, where it was photographed in the streets by a young enthusiast, Jean-Louis Fatio, outside the shop operated by former Sechaud serviceman Gaillepand. Fatio recorded it as “a blue Ventoux on hydraulic brakes, ex-Ray and ex-Veit”. Rene Veit, a trucking contractor in Geneva, was a well-known Bugatti enthusiast of the era, and he is believed to have been the owner for whom this car was registered as GE 33200 in 1956. 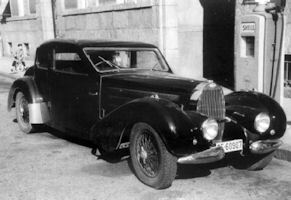 In 1957, the car was registered to James Ray Chandler and later passed to Karl Roy Ivarsson, both of whom were Americans residing in Geneva. Mr Ivarsson operated the city’s first disco at Zermatt, and he was referred to in the popular press of the day as “the pied piper of fun”. 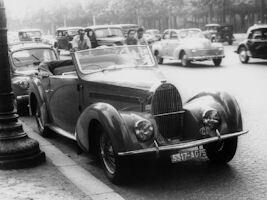 The pied piper sold his Bugatti in 1962 to E. Allen Henderson, of Marlboro, New Jersey, at which point the car departed Switzerland for the first time in its quarter-century-long life. At some time around this point, the car suffered from an engine bay fire, which damaged the driver’s side bonnet panel and blistered much of the paint on the front end of the car, but otherwise, most importantly, it left the Bugatti largely undamaged. 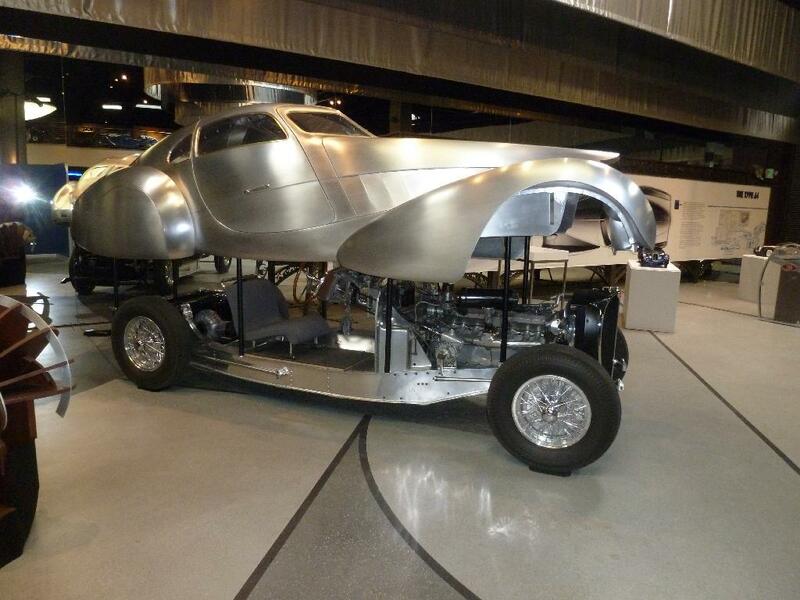 Around 1964, it was sold by Henderson to a talented American engineer from central Pennsylvania, David Trevorrow, who set about returning the car to the road. The paint was stripped from the singed panels, and the wiring loom was renewed. 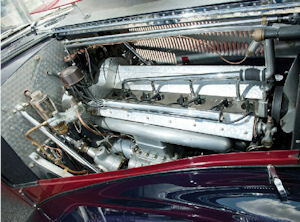 After completion of the work, the car was actually driven on the road in 1966, but its restoration was never finished. 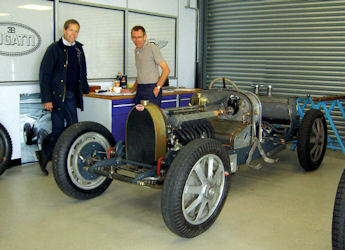 Soon afterward, it was put away in Mr Trevorrow’s garage, where it remained until its sale by his estate in 2011. 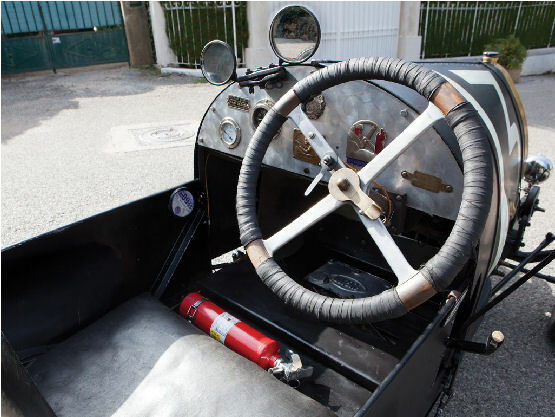 The car’s new owner sent it to Auto Classique Touraine in France, where the bodywork was restored in its original dark blue colours with an interior in blue leather, as original. 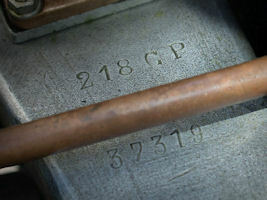 Importantly, some of its body panels still retain their original stamping of 106, identifying it as one of the final third-series Ventoux bodies produced. The car was found to still be in very good mechanical condition overall, as it was running with proper oil pressure and compression, and its brakes were rebuilt. 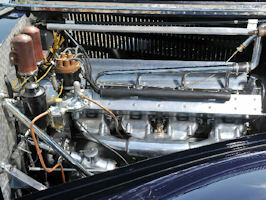 Every component of the car was dismantled and properly refinished to return it to its original condition and appearance. Just over 22,000 kilometres are recorded on the odometer, and given its use mainly around Geneva for so much of its life, this may well be its original mileage from new. 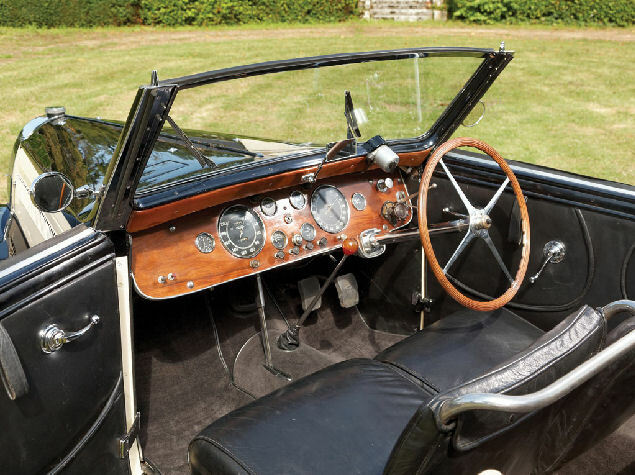 This is a wonderful example of one of the latest and best Ventouxes, as it has fascinating known history and has been preserved by loving enthusiasts on both sides of the Atlantic. The report of Bugatti historian Yves-Paul Laugier, a copy of which is on file, states that the car offered here, chassis number 57467, was the very first Type 57C sold, and it was also the first Gangloff Type 57 Drophead built. Laugier notes that the records of Lyon Bugatti agent Pierre Monestier list that its original owner, Dr Jacques Kocher, returned his previous Type 57 Stelvio and placed an order for the Type 57C on 15 December 1936. That order was later cancelled and a new order was placed on 10 February 1937. It is believed that the December 1936 date was the delivery of the chassis at the Gangloff shop. The delivery of the first Type 57C to Dr Kocher could not have been more apt. 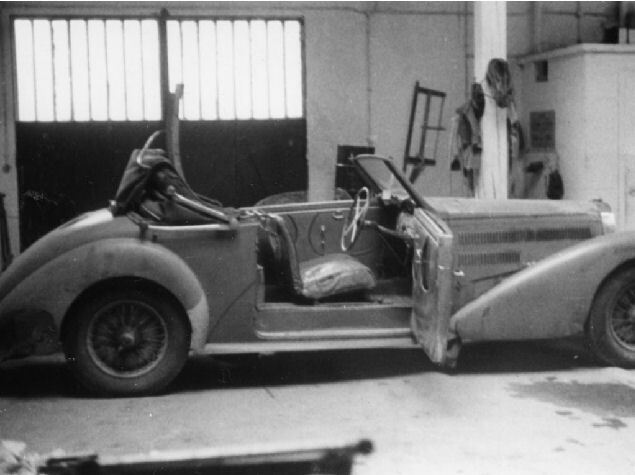 The good doctor was the head surgeon at the Valence hospital in Drome, and he was also Monsieur Monestier’s best customer, as he ordered a total of 14 Bugattis between 1925 and 1938. Dr Kocher was well regarded at the Bugatti factory for his patronage, and his automobiles were often the first to receive the latest features, such as, in this instance, a supercharged engine. Monestier’s sales book recounts that Dr Kocher registered the car in Valence as 61 FA 3 in February 1937. 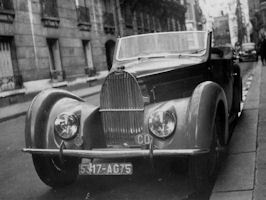 As he usually did, he kept the Bugatti for one year before trading it in for the next model, and in March 1938, it was sold to a Parisian buyer, who registered it as 4964 RL 6. 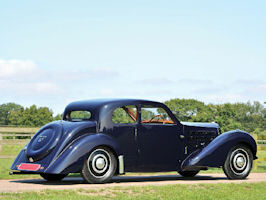 A second Parisian owner purchased the car on 16 June 1939. A 1942 registration book sourced by Laugier records the car as having been sold on 24 February 1942 to the Garage Moderne, of 122 Antibes Street in Nice, and registered as 3416 BA 7. 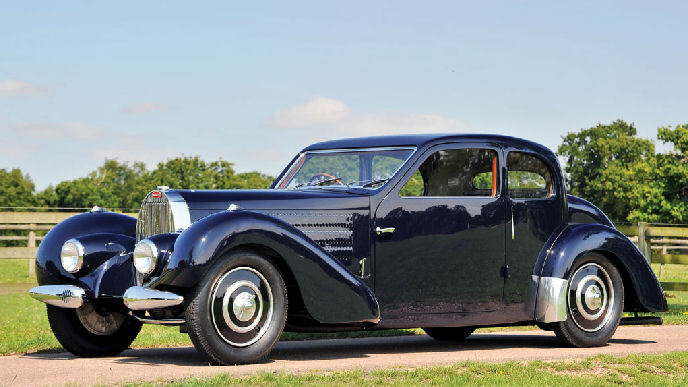 It was later sold back to Paris, still during the war, on 31 March 1943, and it was registered as 5666 RN 3. 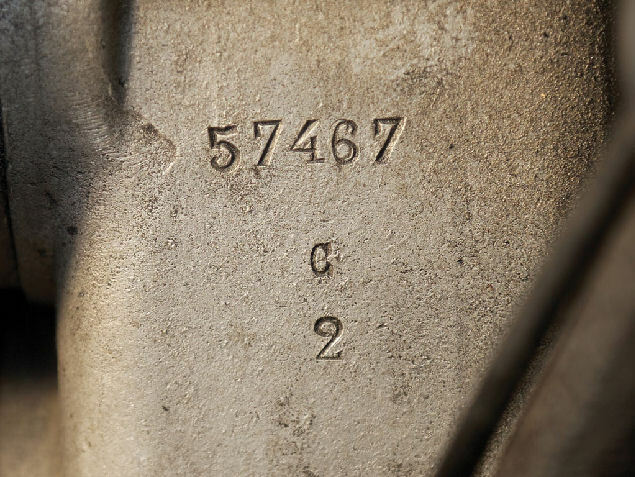 Around that time, its identity was changed with the installation of a new chassis plate, number 57354, which was taken from a Type 57 Galibier. 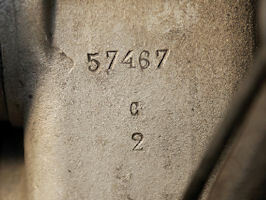 Nonetheless, the car retains its components, and the original chassis number, 57467, is still present on the engine leg, along with the original engine number, 2C, which confirm the car’s continued and genuine identity. On 19 May 1951, the car was registered in Paris as 5317 AG 75, in the name of diplomat William Curteis, who was stationed at the American Embassy at 2 Avenue Gabriel. It is known to have remained in Curteis’s ownership until 1961, during which time it was visited by Phillipe Berlin at the diplomat’s personal garage on the rue de la Tombe, Issoire. It retained its original front bumpers, 57C logo, and dashboard, and it was still finished in Dr Kocher’s preferred shades of green. 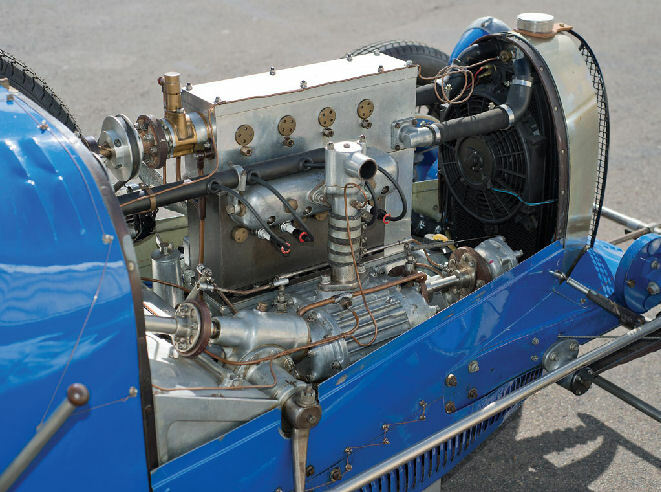 Berlin also noted that hydraulic brakes and Allinquant shock absorbers were installed at this time, which Laugier believes are original features to the car, as Dr Kocher’s Bugattis had always been the first to receive new specifications. 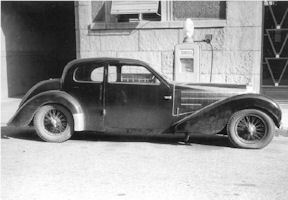 Berlin also recounted that the car had been previously owned by a very well-known Bugatti, Ferrari, and Duesenberg mechanic, Joseph Cattaneo, and if so, he was likely the Parisian owner between 1944 and 1951. 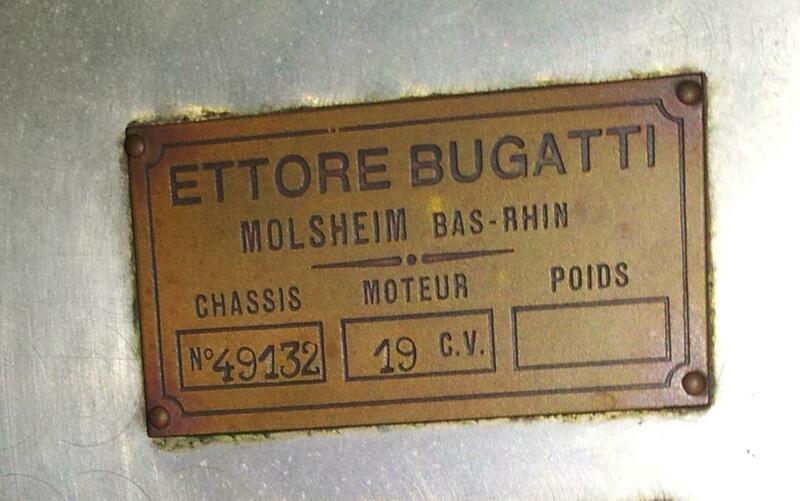 On 29 October 1961, Curteis finally parted with his Bugatti, selling it to Gerard Simonin, of Nogent. 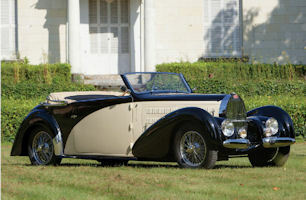 Three years later, it was sold to well-known collector Bernard Delbreil-Berges, of Saint Lizier. Delbreil-Berges kept this car until the mid-2000s, often entering his favourite car in international rallies, in which it was enthusiastically driven with gusto. 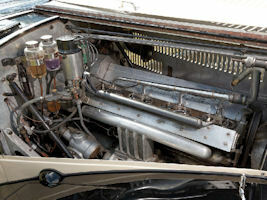 It was repainted during his ownership in black and purple tones, but it always retained all of its original components, including the very rare early 57C intake manifold. In more recent times, the Bugatti was acquired by French collector Michel Blanchard and received a fresh restoration, in which it was refinished in its present and tasteful black and cream colour scheme. 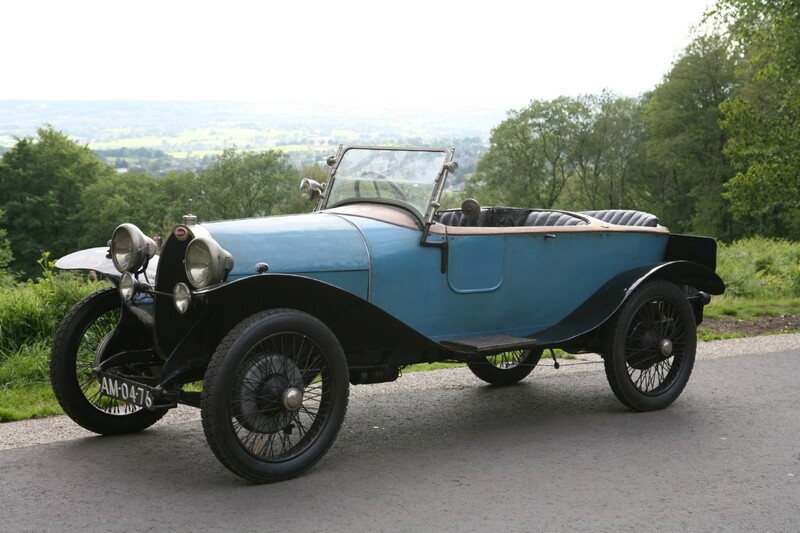 As far as is known, it retains all of its major mechanical components and its original coachwork, with its only significant mechanical upgrades being the hydraulic brakes and telescopic shock absorbers, which were mentioned earlier and are still present today. 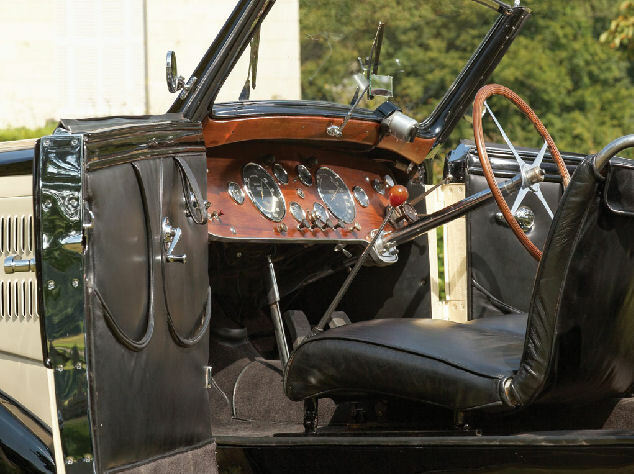 This well-preserved car with its original engine is highly original, and its history has been beautifully documented by Laugier. 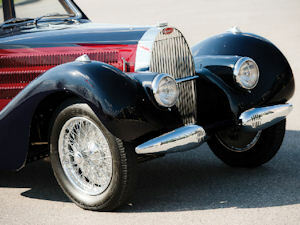 This beautiful car was the first Type 57C produced, and it combines one of the finest body designs with one of the best engines and incredible history, which includes original ownership by one of the factory’s best customers and continued long-term history with great European enthusiasts. It is simply spectacular. Bugatti radiator display piece, plated metal surround with cap and ‘Bugatti’ badge, black painted dummy core, €610 - 860. Type 54 Grand Prix Bugatti body, comprising many body panels painted traditional Bugatti blue, other unpainted panels including bulkhead and dashboard, with some seat parts all from the ex Prince Jiri Lobcowicz, Peter Hampton car that ran in many Czech hillclimbs and in the 2000’s several Festival of Speed hillclimb events, some panels applied with Goodwood number Stickers and Scrutineer’s stickers, front apron bears registration number ‘PM 55’ stickers, used, sold as viewed without bonnet. In recent years the entire project has been saved for future posterity by the current vendor, himself a highly-respected Italian car specialist of particular Maserati renown. It is offered here as viewed, accompanied by “a mountain of spares including a complete spare engine. 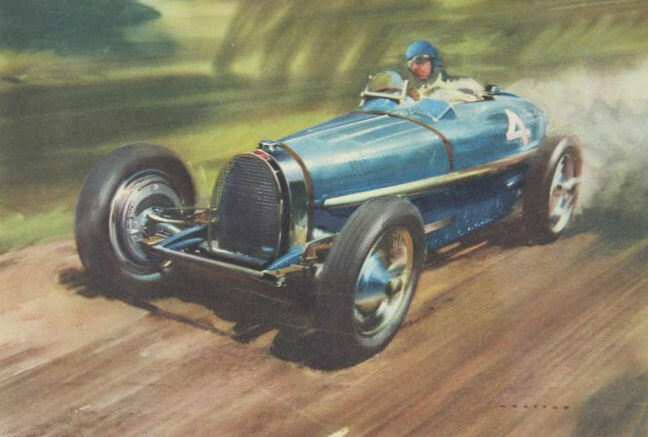 The drawings for the chassis seem to have come out of the backdoor of Colombo’s office whilst he was designing the Bugatti in Milan…and some of them even appear to have had the Bugatti name cut out of them…”. Plainly the full story of this intriguing Ruggeri-Speluzzi project and that of the Colombo-designed Bugatti 251 remains to be fully disentangled, but as a potentially staggeringly-exotic and glamorous Historic Grand Prix car project we absolutely commend this most remarkable piece of earlypostwar Italiana – a fabulous beast, indeed. 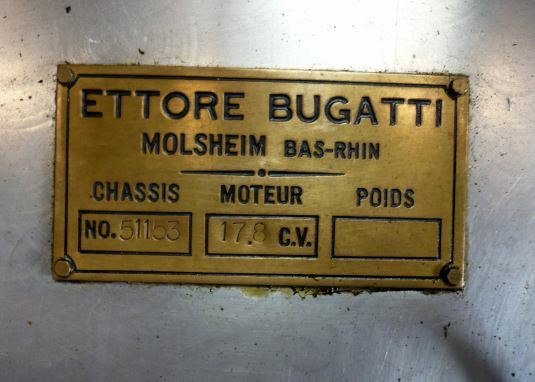 So: who is going to dive into this project, and especially in it's connection with the Bugatti T251?? 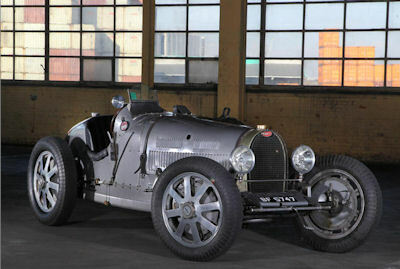 With its fifth model in the six-part “Les Légendes de Bugatti” (Bugatti Legends) Edition, Bugatti has revived the legendary Type 18 “Black Bess”, which went down in automotive history as one of the first ever street legal super sports cars. 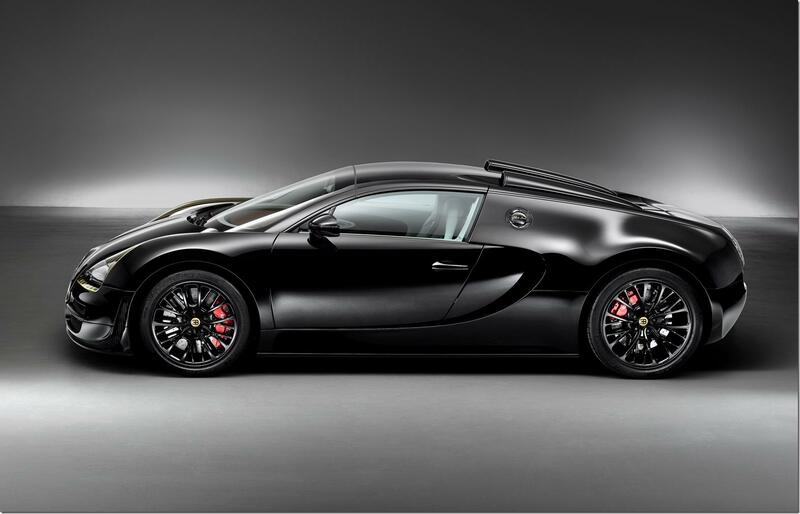 At the upcoming Auto China motor show in Beijing (from 21 to 29 April) the French luxury manufacturer will be presenting as a world premiere the modern interpretation of the Type 18, the Veyron 16.4 Grand Sport Vitesse1 “Black Bess”. 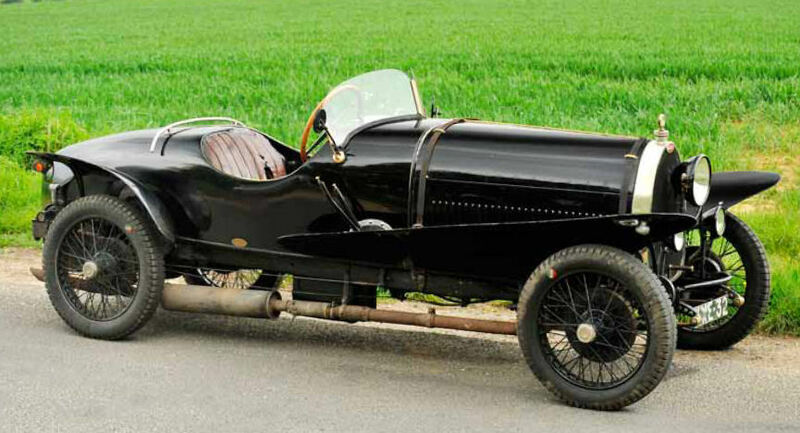 As one of the fastest road vehicles in the world at the time, the Type 18 “Black Bess” is a direct forerunner of today’s world speed record-holding Bugatti Veyron. As with all models in the Edition, the current Legends model is limited to a run of three vehicles and is available for a net price of € 2.15 million. Of the four Legend models already presented, all twelve vehicles have been sold. The Type 18 was one of the most important Bugattis of the pre-war era, both ahead of its time and in a league of its own thanks to its impressive technical features. 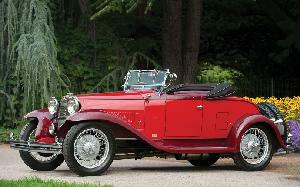 With a 4-cylinder in-line engine and five litre capacity, the vehicle was capable of producing over 100 PS. 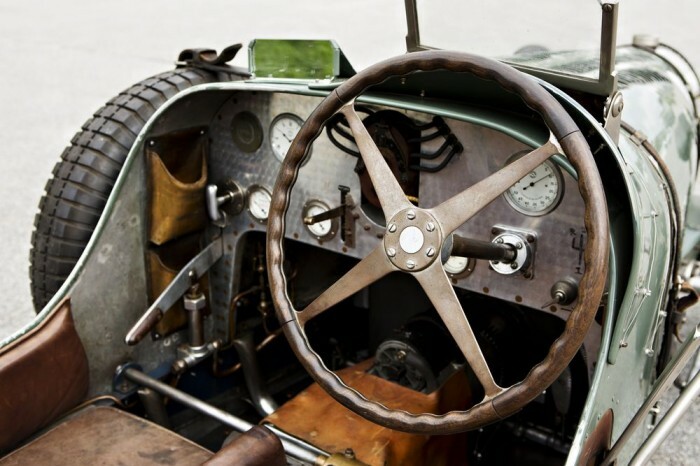 With a top speed of 160 km/h (100 mph), a feat deemed virtually unbelievable for the times, the Type 18 was a true racing thoroughbred and the fastest road vehicle around. 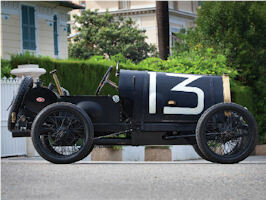 The Type 18 was driven in races by company founder Ettore Bugatti himself; indeed he secured a win in his class in the important 1912 Mont Ventoux hill climb. Bugatti limited the production run for this model to just seven vehicles and sold them to an extremely select group of customers. One of these customers was the famed and celebrated French aviation pioneer Roland Garros, who successfully crossed the Mediterranean in an airplane in 1912 after racking up a host of successes at a variety of aviation events. 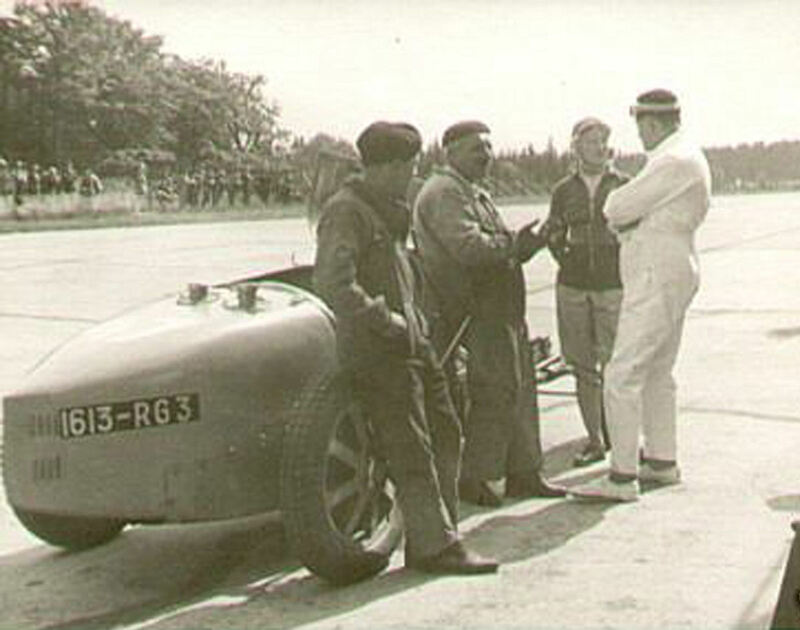 It was Ettore’s victory at Mont Ventoux which drew Garros’ attention to the Type 18. A lover of speed through and through, Garros was looking for a car which would enable him to travel as fast on land as he could in the air. The Type 18 was an obvious choice. In counting Garros amongst his customers, Ettore Bugatti had landed a major marketing coup. 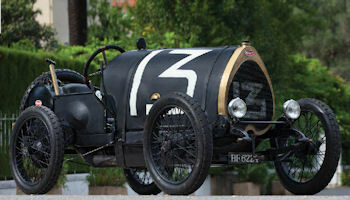 Bugatti delivered the two-seater bearing the vehicle identification number 474 to Garros on 18 September 1913. This Type 18, later named after the English racehorse “Black Bess”, is one of only three of the seven vehicles still remaining. Today, it can be found in the Louwman Museum, a private collection on show at The Hague in the Netherlands. Evert Louwman has kindly made the historic Type 18 “Black Bess” specially available for the world premiere of the current “Black Bess” Legend Vitesse at the Auto China in Beijing. 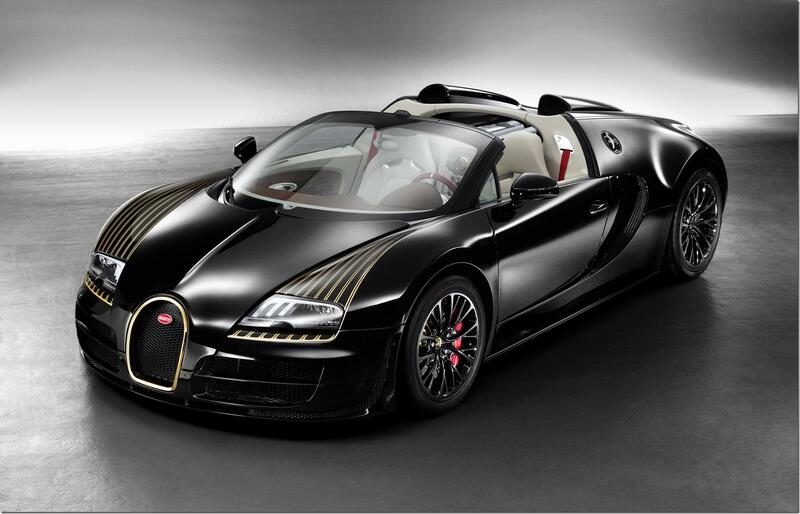 As is the case with all of the Legend vehicles, the “Black Bess” is based on the Bugatti Veyron 16.4 Grand Sport Vitesse. Its 1,200 PS, 8 litre W16 engine achieves an unparalleled torque of 1,500 Nm at 3,000–5,000 rpm, and can accelerate from 0–100 km in 2.6 seconds. With a maximum speed of 408.84 km/h with the roof down, the Vitesse is the fastest production roadster ever built. 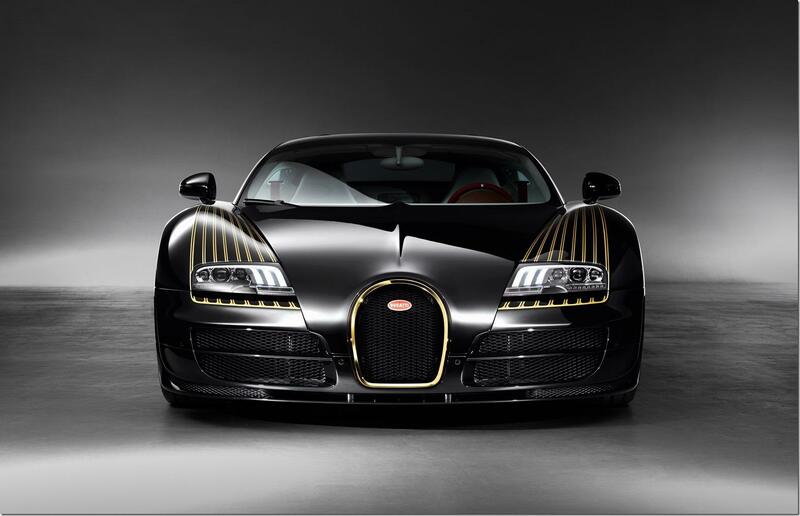 “The ’Black Bess’ Legend Vitesse is yet another fine example of Bugatti’s innovative power when it comes to creating exclusive automobiles,” explains Bugatti Head Designer, Achim Anscheidt. “We have developed a new process for individually hand-painting the leather in the vehicle’s interior, the like of which has never been used before in the automotive industry. The leather and the ink applied by the designer have been technically developed and processed so that they can withstand the stresses inside the vehicle and fulfil the valid quality requirements demanded by modern day production. Exterior. The body of the “Black Bess” Vitesse is constructed entirely of carbon fibre and, just like its historical predecessor, is painted completely black. The gold-coloured accents that make the Type 18 “Black Bess” so unmistakable are reflected in exquisite fashion on the modern Bugatti. 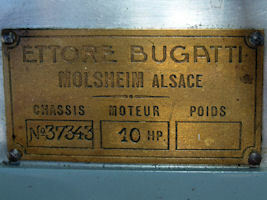 For example, some of the Bugatti’s body components are coated in 24-carat gold. Indeed, this precious material has been used for the striking Bugatti horseshoe, which gleams against the background of the black front grille, creating a truly expressive front view for the Vitesse. This is reinforced by gold-coloured stripes that start below the headlights and radiate out over the front wings towards the rear, before tapering off at the end of the door line. Sporting a similarly brilliant gold finish are the EB logo on the rear of the vehicle and the hub covers on the black rims, which also bear the initials of the company’s founder, Ettore Bugatti, in black. And let’s not forget the tank and oil caps, which have been engraved with the “Black Bess” nameplate and elegantly finished with gold paint. Interior. 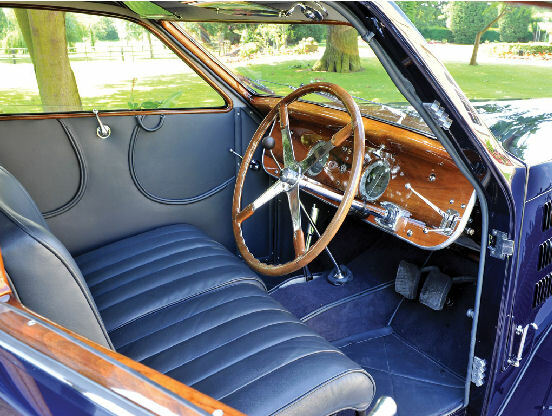 The interior of the “Black Bess” Legend Vitesse has been fully upholstered using the finest leather. The headliner, footwell, seats, elongated centre console and rear bulkhead are bedecked in a light “Beige” tone, with the dashboard, dash panel, door trim panel and cowl panel offering a discreet contrast in ”Havanna”. Clad in red “Crimson” leather, the steering wheel rim draws a clear reference to the historic Type 18 “Black Bess”. This accent has also been picked up and continued in the red decorative stitching on the outer bolsters of the seats and in the seat belts. 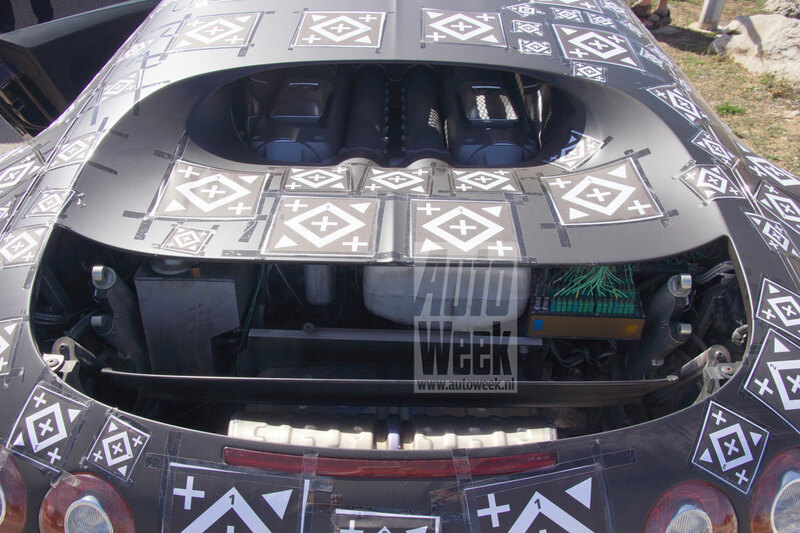 The door panels are without doubt one of the car’s most impressive details. This is actually one of the most daring projects in the design of the vehicle’s interior. 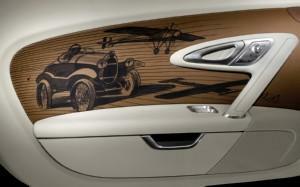 Both panels are upholstered in “Havanna” leather and bear scenes which depict the historic Type 18 “Black Bess” as well as Roland Garros’ airplane, a Morane Saulnier Type H. These sketches have been hand-painted directly onto the leather – just as the components in luxury vehicles were hand-painted in the early 1920s. In order to protect the images from abrasion and environmental impacts, both a special new ink and a new impregnation process have been developed. 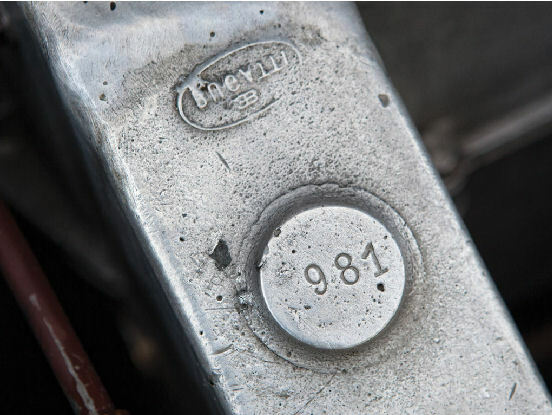 Never in the field of automobile manufacturing have traditional details been implemented so perfectly whilst also upholding the demands placed on quality by modern production standards. 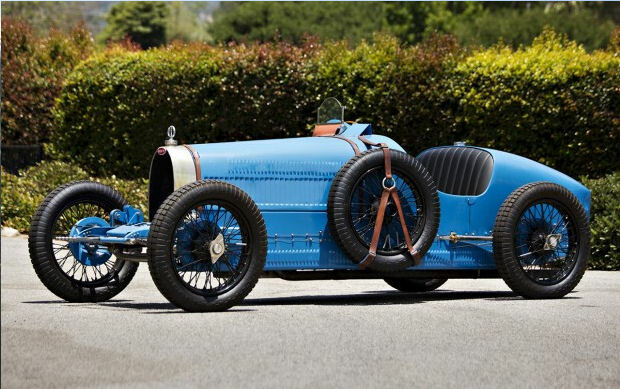 This reconfirms Bugatti’s strength in innovation. And it is coupled with a strong focus on individuality, as none of the six door panels in the three Legend vehicles is identical. 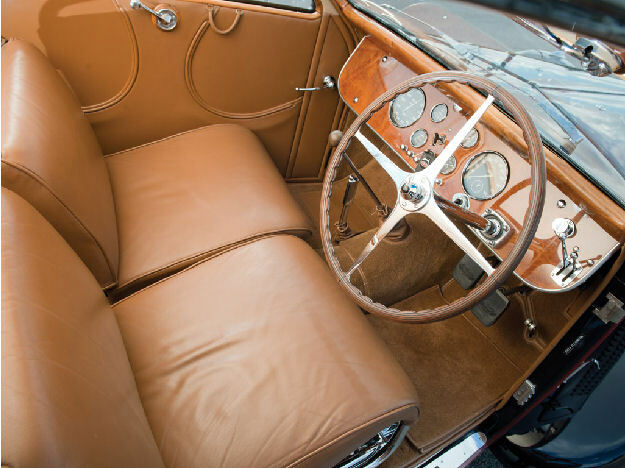 The demands placed by Bugatti on handling refined materials and on maximum faithfulness to the original vehicles can also be seen in the use of high-quality rosewood for the selector lever and the centre console panel in the vehicle’s interior. Gold can also be found inside the vehicle itself, such as the EB logo on the cover of the rear storage compartment, which is also finished in beige leather and hand-painted with a motif showing the historic vehicle. 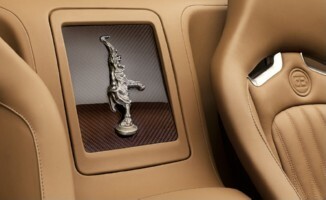 Of course, typical Legend features have also been included in the vehicle, namely the beige, leather-clad insert in the centre console extension which bears the “Les Légendes de Bugatti” nameplate, the relief of the dancing elephant (the symbol for the Legends Edition which has been refined with a gold finish for this model), and the door sills bearing the image of the Type 18 “Black Bess”. 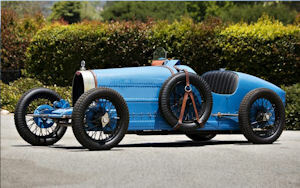 The Bugatti Type 18 was manufactured from 1912 to 1914. 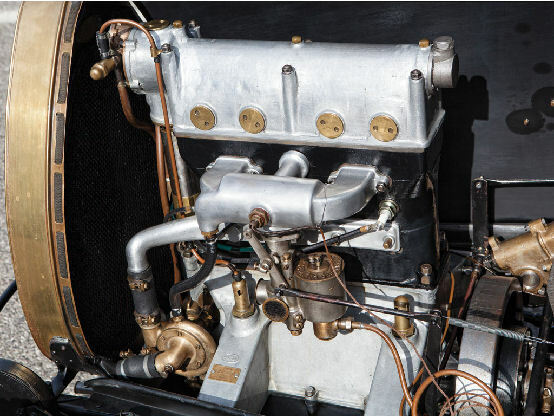 At its heart was an impressive 5 litre, 4-cylinder in-line engine with 100 mm bore and 160 mm stroke, a crankshaft mounted on three bearings and an overhead camshaft. 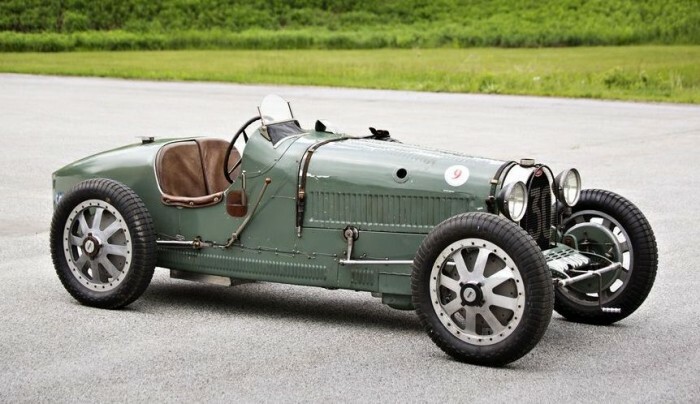 New for Bugatti: this design was fitted with a chain drive. 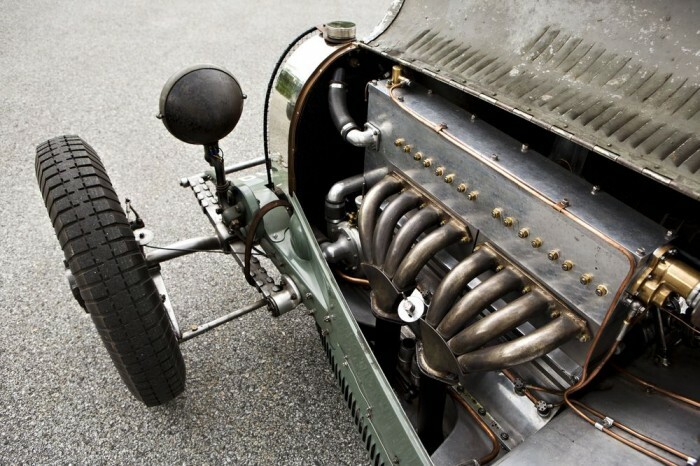 It sported three valves per cylinder; two small intake valves and a large outlet valve. 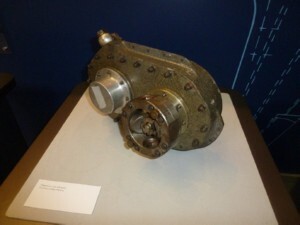 The extremely lightweight and small gearbox offered four forward gears and a reverse gear. The 2.45 m wheelbase and 1.25 m track width ensured the 100 PS vehicle’s exceptional manoeuvrability, particularly when cornering. Auto China Beijing 2014 takes place from 21 to 29 April in the China International Exhibition Centre in Beijing. The Bugatti stand will be located in Hall E5. Another "Legend", with what is basically a fancy paintjob and a few paintings in the interior, erroneous ones at that, because the car was never called "Black Bess" while in the hands of Roland Garros (thus the connection with the Morane Saulnier airplane is wrong), that name was give to the car much later. Maybe the name "Roland Garros" had been more appropriate to this legend? 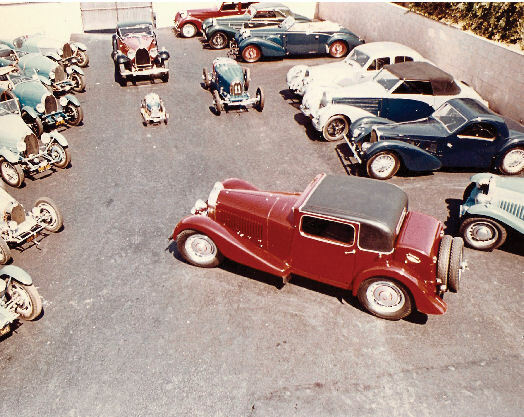 The whole line of these 5-litre 4-cylinder Bugattis were referred to as Roland Garros in later days. The Grover-Williams Trophy race at the 2014 Goodwood Members’ Meeting was held March 29-30 at the 2.4-mile Goodwood Motor Circuit in West Sussex, England. 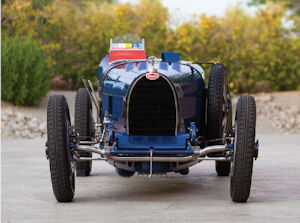 To celebrate the 90th anniversary of one of the most successful racing cars of all time, the Bugatti Type 35, a special one-make race was staged at the 72nd Members’ Meeting, featuring a variety of pre-war models. Goodwood’s exclusive race for pre-war Bugatti race cars was staged in honor of William Charles Frederick Grover-Williams. Grover-Williams is remembered for his victories in the 1928-29 French Grands Prix, and for winning the inaugural Monaco Grand Prix in 1929 aboard his British Racing Green Type 35. During World War II he was recruited into the Special Operations Executive (SOE) and was executed in Berlin in 1945, a matter of weeks before the end of hostilities. 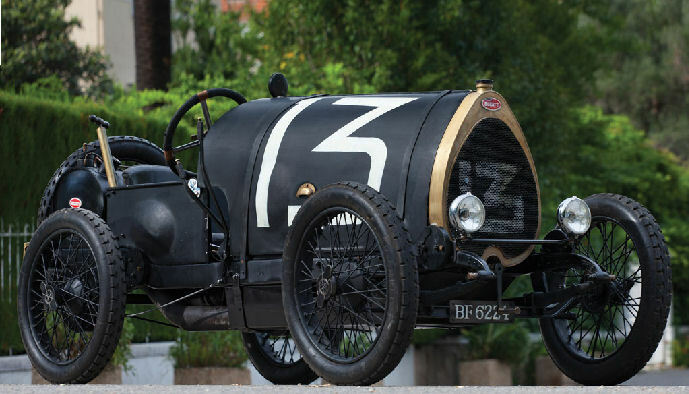 Introduced at the 1924 French Grand Prix, the Type 35 is widely believed to have won in excess of 1000 races, and inspired a generation of successful Bugattis. The Grover-Williams Trophy race at the 2014 Goodwood Members’ Meeting featured several variations on the Type 35 theme plus models such as the Type 51, Type 54 and Type 59. The winner was the Bugatti Type 35B of Charles Knill-Jones, who finished nearly a staggering 46 seconds ahead of the Type 35 of Duncan Pittaway. 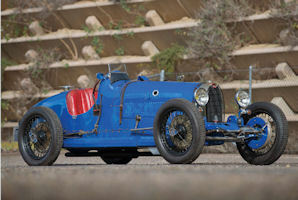 Charles McCabe’s Type 59 and the Type 35B duo of Chris Hudson and Bo Williams rounded out the top five. "The Art of Bugatti" at the Mullin Automotive Museum. 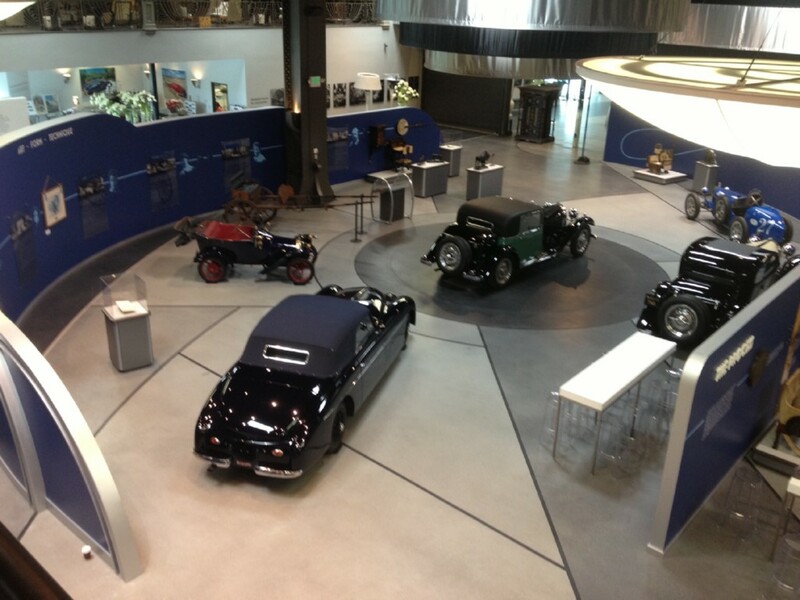 There have been quite a few exhibitions on Bugatti, though far less were organized about the entire Bugatti family. The exhibition at the Mullin museum is not the first one though, exhibitions on the entire family were organized in London in 1979, Hamburg 1983, Kobe 1993, Amsterdam 1998/99, Cleveland 1999 and probably a few that I forgot about. Though I have not seen all of these exhibitions, I can readily say that the one at the Mullin museum is the best that has been organised so far. As Peter Mullin said so very strikingly at the opening event on Sunday, March 23, the Bugatti family is unique in the history of the arts, worldwide. No other family has been so successful in so many different arts, over 4 generations! Probably the closest was Johann Sebastian Bach, who was part of 7 generations of musicians (though not all geniuses, and of course all in the same art!). In fact, there were 2 "opening nights" after each other. 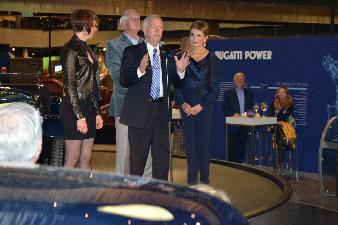 On the Saturday there was the American Bugatti Club dinner at the Mullin museum, the day after was the opening event. The photograph above is of Peter Mullin, holding the speech at the opening event, with Caroline Bugatti on his left, and his wife Merle Mullin to his right. The real star of the exhibit was the Bugatti Replica airplane. Above right Peter Mullin in between the main men of the "Reve Blue" team; From left to right: Scotty Wilson who started the replica project, Peter Mullin, John Lawson and Simon Birney. The presence of the Bugatti airplane (which has not flown yet, but will be finished after some months in the exhibition, and then fly probably this year or early in the next) made this exhibition so very special, compared with all earlier ones (though there were occasionally models of the Bugatti 100P on show). On the Thursday - press day - many of the journalist passed the EB110SS, T101, T55 and a Royale, to see the most beautiful airplane of all times first! 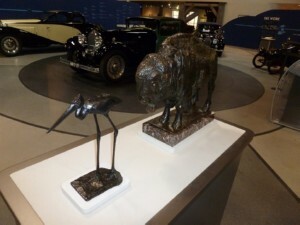 And, Mr. Mullin and his team, notably the lovely Brittanie Kinch who did a splendid job on the exhibition, for the first time to my knowledge showed many of the Lidia Bugatti art, illustrated on the right with a beautifully painted fantasy radiator mascot, reminding somewhat of her uncle Rembrandt's bronzes. Many of the Lidia Bugatti art is part of Mr. Mullin's collection. Not only were there many unique items in the exhibition, it was also very well displayed, presenting the Bugatti family as a whole rather then each of the artists separately; Ettore's and Jean's automotive designs, were presented side by side with Carlo's furniture and Rembrandt Bugatti's fabulous bronzes, of which there were many, some 20 or so on loan by the Sladmore Gallery. On the left: Scotty Wilson speeching about the Bugatti 100P airplane, and how it marked the end of an era in which Bugatti was THE name in automotive engineering, and a combined effort of both father Ettore and son Jean, as well as Louis de Monge of course. To the right of it a couple of overview photographs, taken from the upper level of the museum. 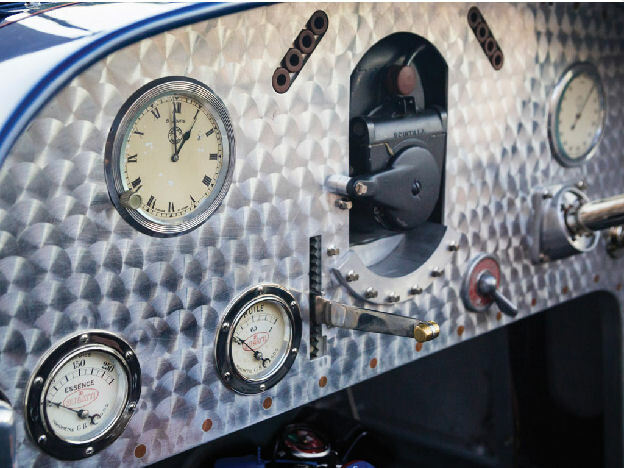 With all of this art, I was afraid that the technical aspect of the Bugattis would be under-exposed, but I was very pleasantly surprised! Above left the gearing from the original airplane, which sits in front of the forward engine. On the right one of approximately 20 molds for Bugatti parts, mainly for engines. Molds ranged from T41 to T68, and showed part of the manufacturing process. 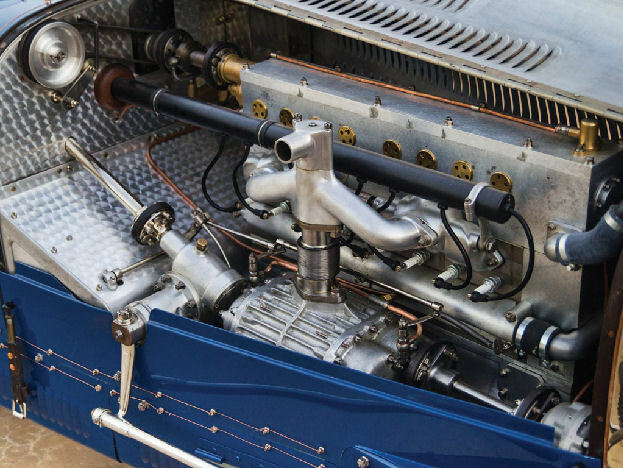 Last but not least, there was the Type 64 chassis, which was shown in full splendor, revealing all of the details of this aluminium chassis Bugatti. Hovering above it was the body that the museum had specially designed and built for it, in the bare aluminium showing all the craftsmanship of the builders who made it very much in the same way as they would have 70 years ago. The wooden buck is shown alongside the T64. 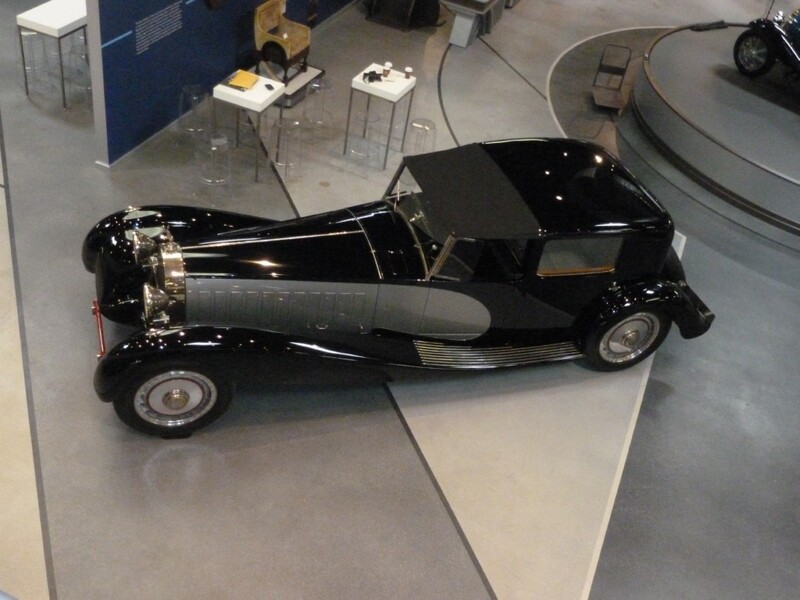 Of course there were also the Bugatti cars in not-restored condition, from the Malmerspach collection and of course the Brescia from the Swiss lake. 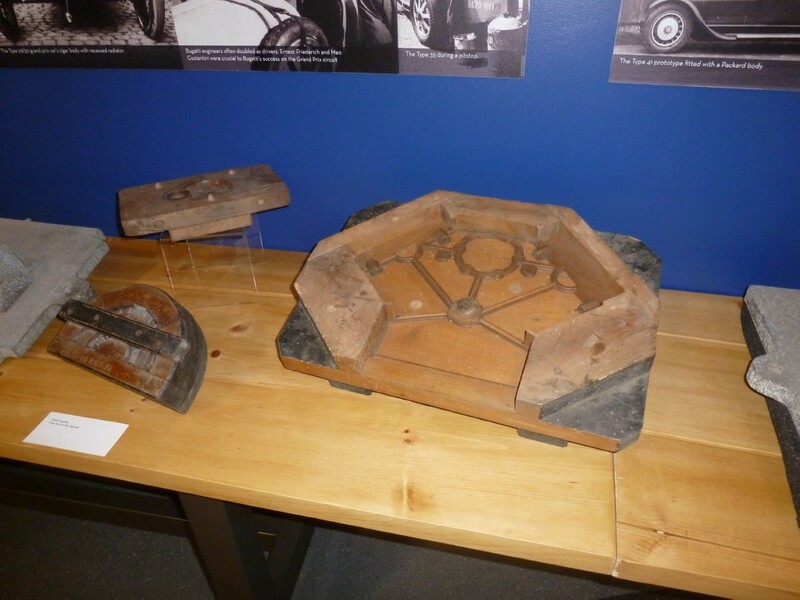 There was a lot more; Bugatti automobile parts, workbench, vise and tyre stand, AutoRail engine, Bugatti factory door and hinges, You-you boat (engineless), Bicycle, carriages, many brochures and posters. Of Carlo there were also paintings, drawings and silverware, and of Rembrandt there were also sketches, apart from the bronzes. But of course, the succes of the opening evening very much depended of the people present, I had quite a few interesting meetings and was a very happy man there, as the picture on the right shows! The museum had organised docents to inform the attending public, many friends of the Mullin's, about the cars, the plane (though Scotty was there all night talking about his project!) 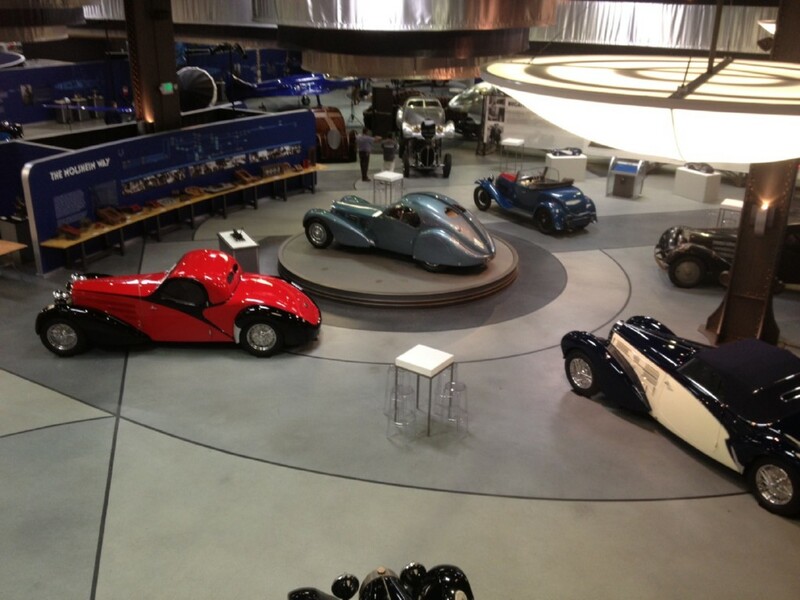 and all of the Bugatti history. Interesting people also, like Larry Crane, long time auto-journalist, and Randy Leffingwell, author of many books on a different marque, though the founder of that marque, Ferdinand Porsche, knew Ettore Bugatti personally. Thanks to Peter Mullin for inviting me to the opening! 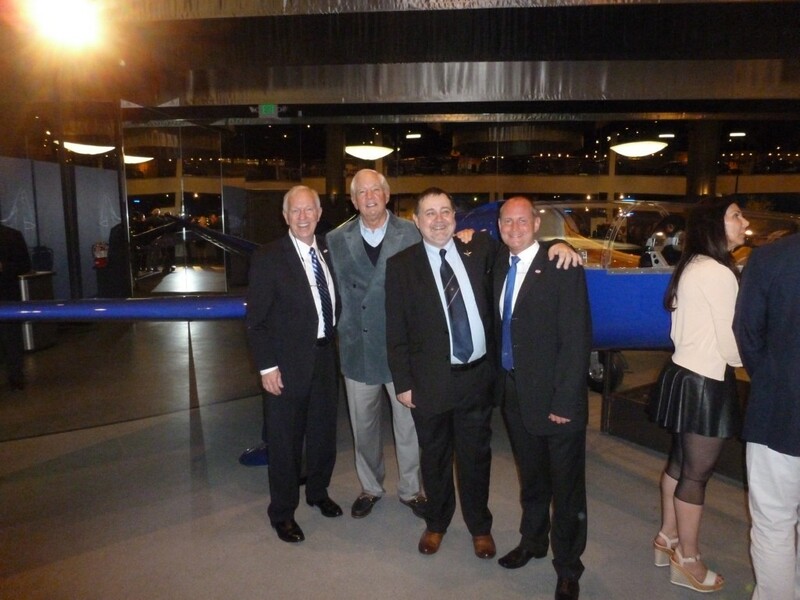 And thanks to Lance Baumberger for helping me out with many of the practicalities of the visit to CA. Lance also provided some of the photographs. 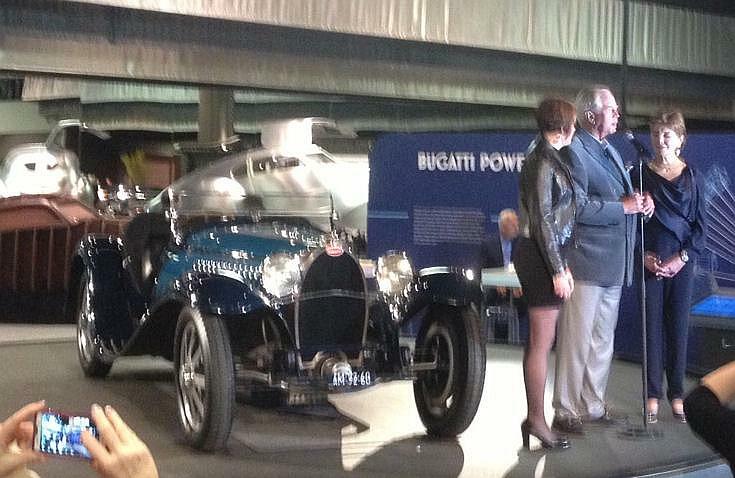 After the opening an exceptional and unique Bugatti has been added to the exhibition! General William Lyon's Type 10! I know that many Bugattistes think in numbers mainly, so here they are: 1361, 2461, 4634, 37129, 41111, 43272, 43289, 44739, 46136, 46360, 49377, 50117, 51132, 379A (Baby), T54/50 BC70, 55208, 57374, 57377, 57492, 57535, 57768, 57801, 64002, 101501, EB110SS, Veyron SuperSport WRC edition. The main prizes at the Concours d'Elegance went to a Horch and a Scarab, as far as I know no prizes went to any of the Bugattis present. 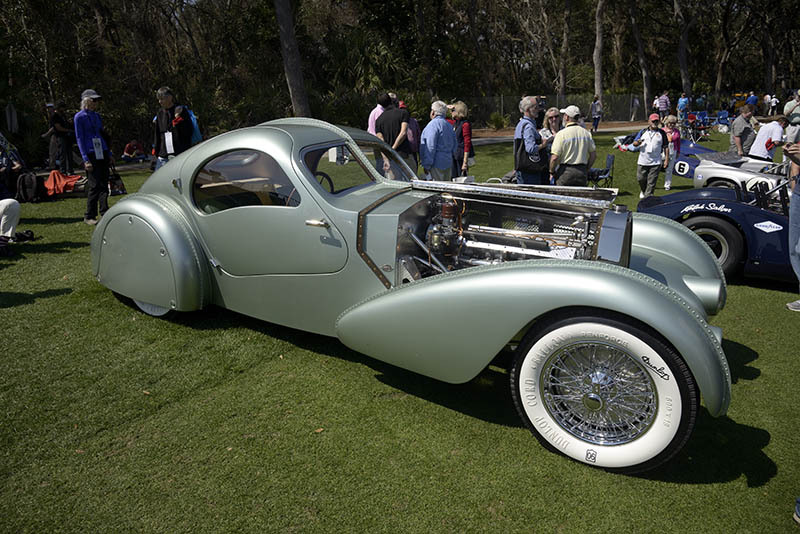 And there were some fine Bugattis there, as the pictures below, sent by Terry Cook of "Pacific" fame (the last photo) show. 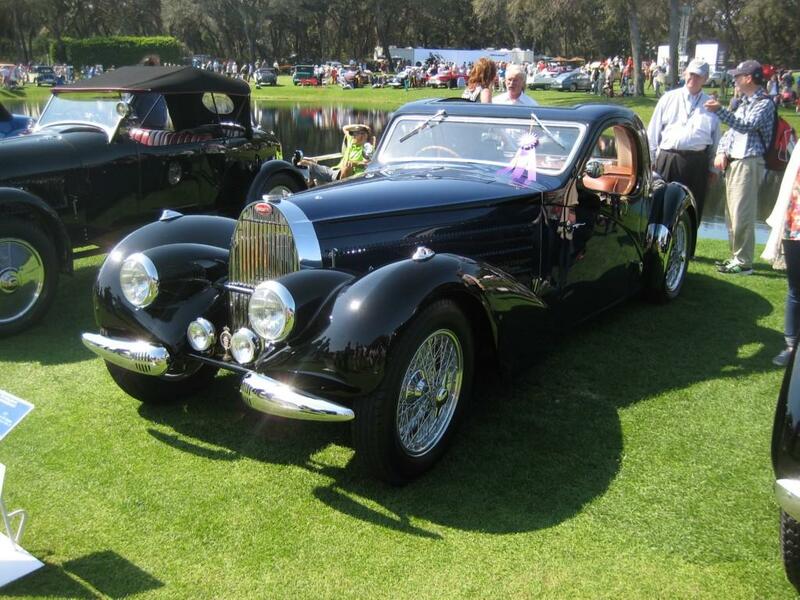 Turns out there was one prize for a Bugatti: Bugatti 57104, the Aerolithe Replica by The Guild of Automotive Restorers from Canada was shown at the Amelia island Concours and it did win Best New Coachwork or Recreation. See Photographs above. 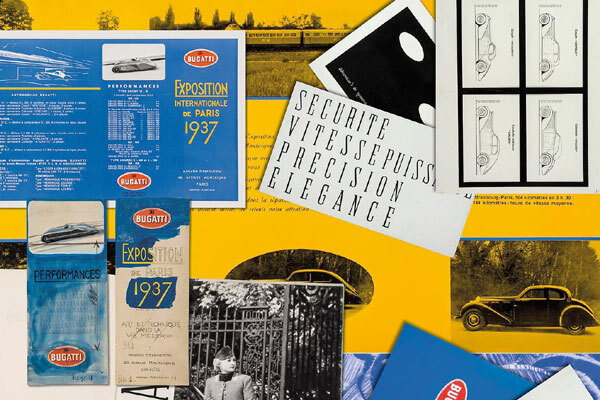 Bugatti is continuing its six-part edition series, “Les Légendes de Bugatti”, at the Geneva International Motor Show (6–16 March) to honour some of the more important people in the company’s history. Last year the long-established French brand successfully presented the first three Legends models. All nine vehicles of these model series have been sold. 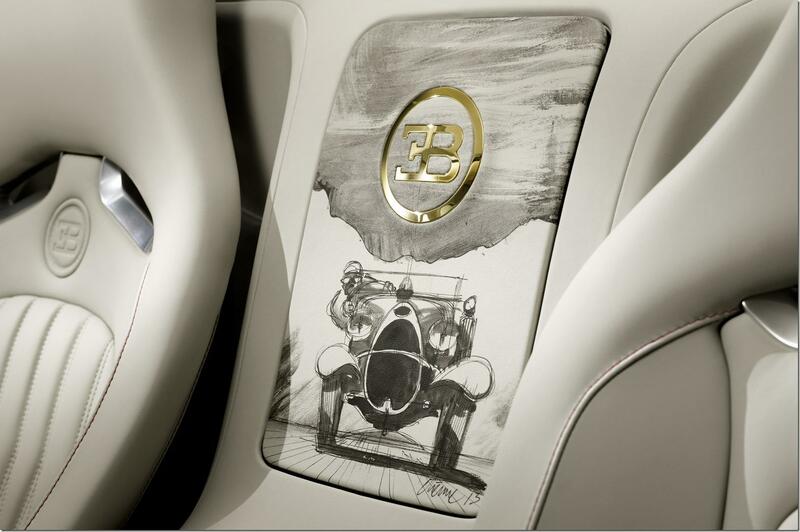 Now Bugatti is celebrating another high point with its fourth legend – named in honour of Rembrandt Bugatti, brother of company founder Ettore and one of the most important sculptors of the early 20th century. One of his most significant works is the sculpture of a dancing elephant. 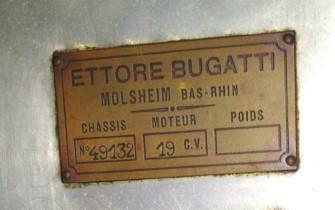 It decorates the radiator of the Bugatti Type 41 Royale and became the brand’s symbol. 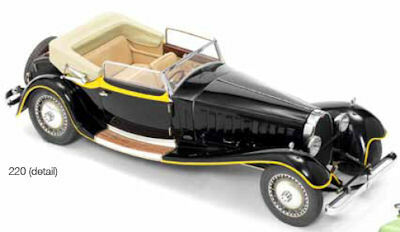 The Legends model is based on the Veyron 16.4 Grand Sport Vitesse1. As with the other Legends models, only three will be manufactured. 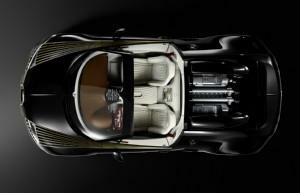 The “Rembrandt Bugatti” Vitesse costs €2.18 million Euro net. The art world views Rembrandt Bugatti as one of the most notable and artistically independent sculptors of the early 20th century. 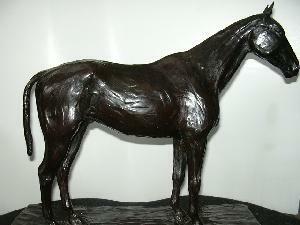 He became famous through his animal sculptures, and cast a large part of his work in bronze. 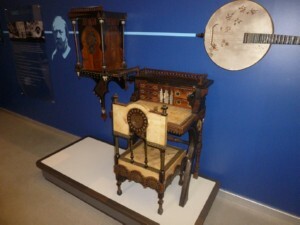 The pieces are now on display in several collections and museums across the world. 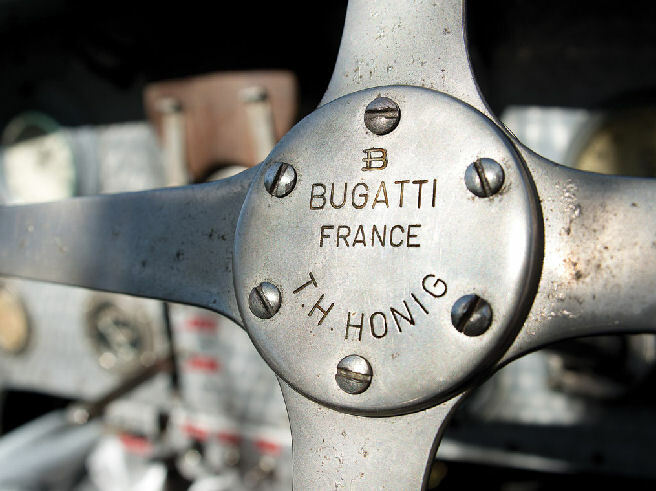 In the same way that Ettore saw automobile creation as an artistic process, Rembrandt Bugatti’s fame was based on his extraordinary artistic talent and his formidable manual abilities in manipulating surfaces. 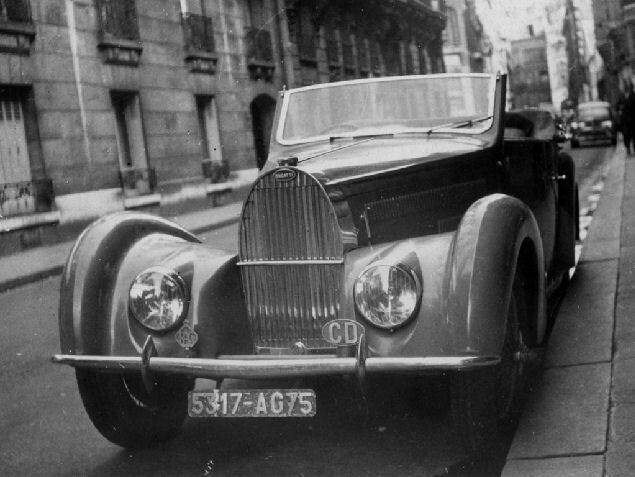 The “Rembrandt Bugatti” is the fourth Legend from the brand. 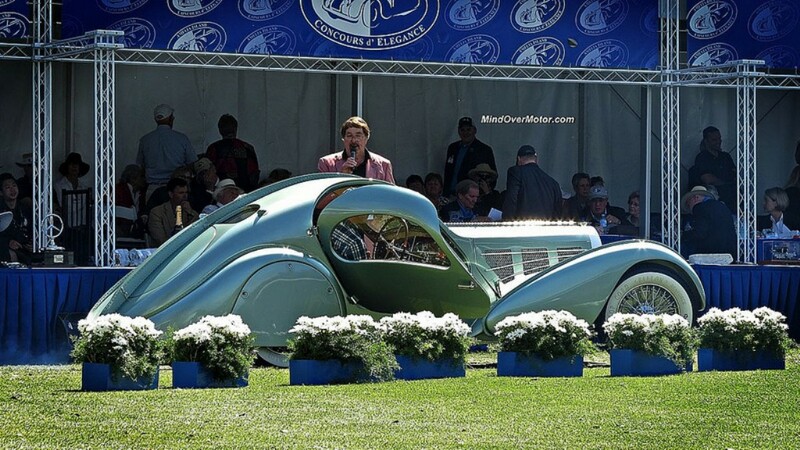 To launch the “Les Légendes de Bugatti” edition last year, Bugatti presented “Jean-Pierre Wimille” at California’s Pebble Beach, “Jean Bugatti” at the IAA in Frankfurt and “Meo Costantini” at the Dubai Motor Show. “The Legends edition is a great success for Bugatti. The response from our customers is amazing,” said Dr Wolfgang Schreiber, President of Bugatti Automobiles S.A.S. 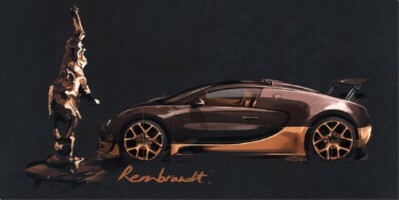 The “Rembrandt Bugatti” is based on the Bugatti Veyron 16.4 Grand Sport Vitesse. Its 8 litre W16 engine achieves an unparalleled torque of 1,500 Nm from 1,200 PS at 3,000–5,000 rpm, and can accelerate from 0–100 km in 2.6 seconds. With a maximum speed of 408.84 km/h with the roof down, the Vitesse is the fastest production roadster ever built. Exterior: The body of the “Rembrandt Bugatti” Legend Vitesse was designed in the “horizontal split”, and is largely composed of bronze-coloured clear-coated carbon as a gesture to the artist’s favoured material. 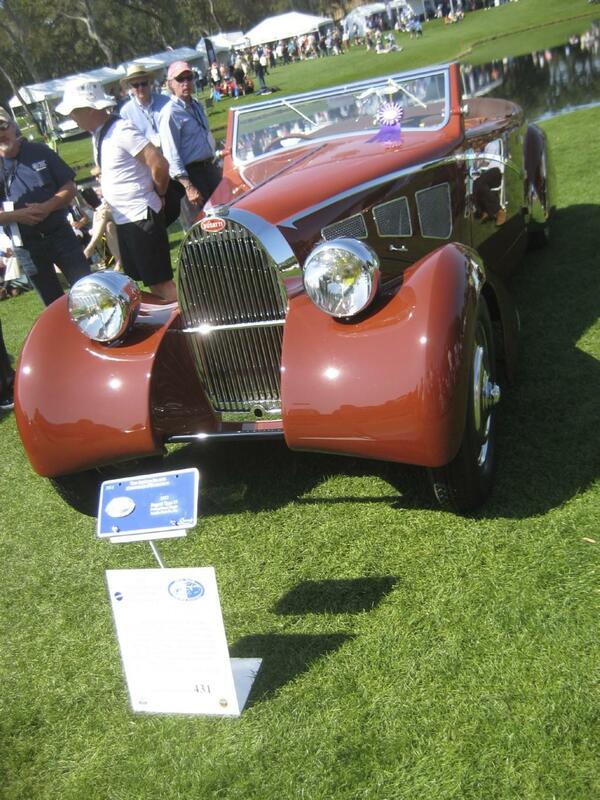 The vehicle’s lower half is painted in an elegant light brown, “Noix”. The famous Bugatti horseshoe gleams in platinum from the front grille, with platinum also ringing the EB logo at the vehicle’s rear. The wheels are painted in dark “Firefinch” and light “Noix” browns, and these colours combine to complete the elegant appearance and set the super sports car off against the asphalt. In reference to the artist and Legends car’s namesake, Rembrandt Bugatti’s signature has been lasered onto the petrol and oil cap. 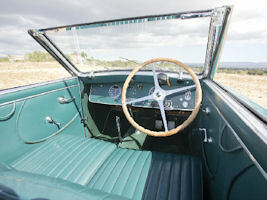 Interior: The elegant and harmonious appearance continues in the vehicle’s interior. The Vitesse is completely upholstered with leather in light brown “Cognac”. The rear centre box between the seats has a striking design. It proudly sports Rembrandt Bugatti’s famous elephant sculpture, the hood ornament of the Type 41 Royale and today is the symbol for both the brand and the Legends edition. The elephant was cast in bronze with great technical skill and worked as an insert into the cover. The cover is made of bronze-coloured clear-coated carbon. 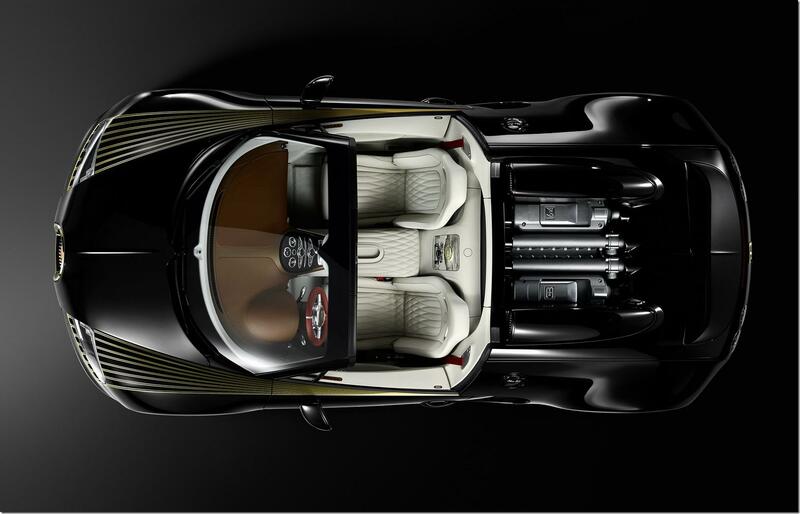 The door trim is impressive evidence of Bugatti’s reputation for working high-quality materials in a unique style, with braided leather in the softly contrasting colours of “Cognac” and “Coffee”. This elegant design was developed exclusively for this Legends car. Platinum is also in evidence in the vehicle’s interior, on the EB logo on the steering wheel. Other interior details specific to this Legends Vitesse are the insert of bronze-coloured clear-coated carbon on the extended centre console with the lettering “Les Légendes de Bugatti” and Rembrandt Bugatti’s elephant, and the door sill plates displaying the sculptor’s portrait and signature. Rembrandt Bugatti (1884-1916) ranks among the most remarkable and individually artistic sculptors of the early 20th century. 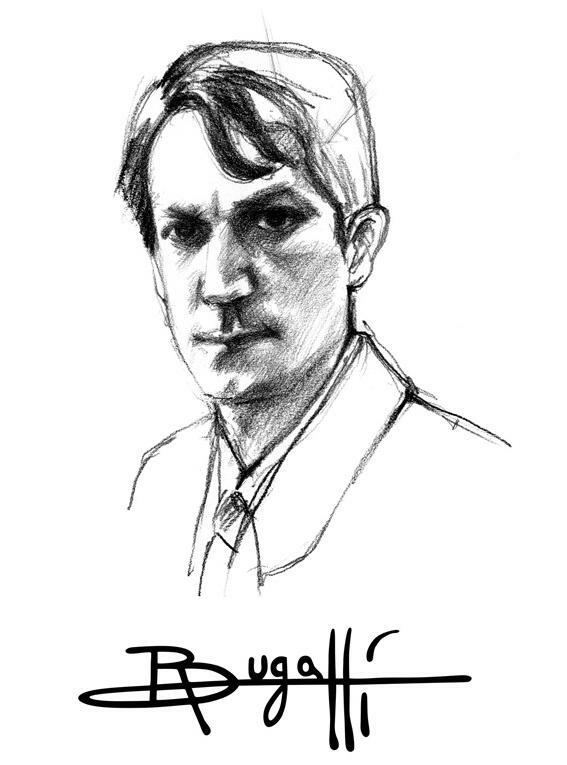 Born in Milan, Rembrandt was Ettore Bugatti’s younger brother. 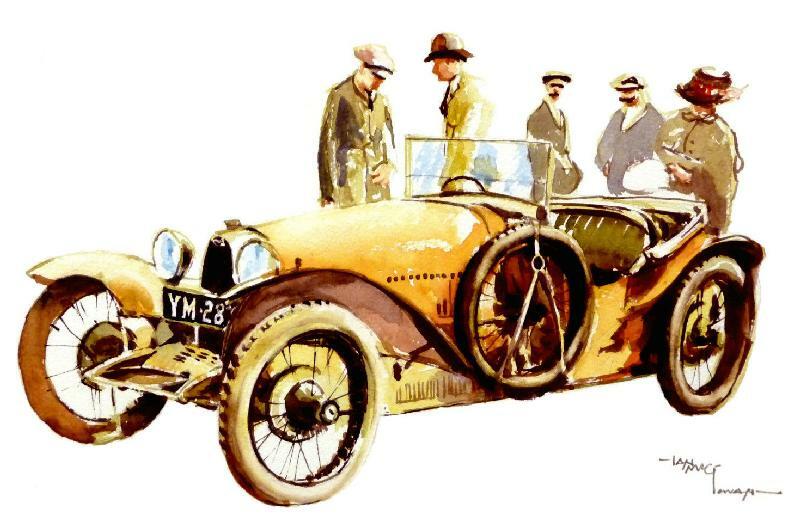 His exceptional talent was discovered early on, though his father Carlo Bugatti, himself successful as an artist and designer, had initially planned a future as an engineer for the young Rembrandt. After Rembrandt began sculpting at an early age, his father sent him to the Brera Art Academy in Milan. His very first exhibitions in Venice and Paris caused great sensations. Over the course of his short life, Rembrandt’s oeuvre came to include over 300 bronzes, paintings and drawings. Rembrandt’s great artistic passion for animals emerged at an early stage. He began modelling cows, horses and dogs, and was later inspired by the more exotic forms on display at the zoological gardens in Paris and Antwerp such as anteaters, tapirs, hippopotamuses and elephants. Rembrandt created a great many elephant sculptures, but it was his dancing elephant that became perhaps the most recognisable symbol for the Bugatti brand. It is, after all, the silver hood ornament that adorns the Type 41 Royale. Because of his incredible flair for capturing the very essence of the animal in a sculpture, he was known across Europe and America. 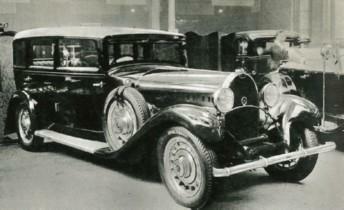 The First World War drove Rembrandt Bugatti to take his life in Paris in 1916. He was only 31 years old. Dedicating this Legend to Rembrandt seems a bit strange; he had really very little connection to the cars, and of course died before his brother Ettore really came to fame. And of course the standing elephant must be incorporated again, while Rembrandt did make many more impressive sculptures, like the famous "Walking Panther" or the "Hamadryas Baboon". This amazing wooden crib was a gift offered to Ettore Bugatti for the birth of his son Jean and was built by the carpenters of the Bugatti factory. It was used for many years by the other children of Ettore Bugatti and eventually given to the family nurse. Her children later sold it in an auction in 2001, via the help of the Baron de Weibel, who was an antiquarian, neighbor and friend of the Bugatti family. This gentleman, who has now passed away, was a friend of the seller, a German lady and purposely decided to leave out the most interesting details when he described the crib during the auction. 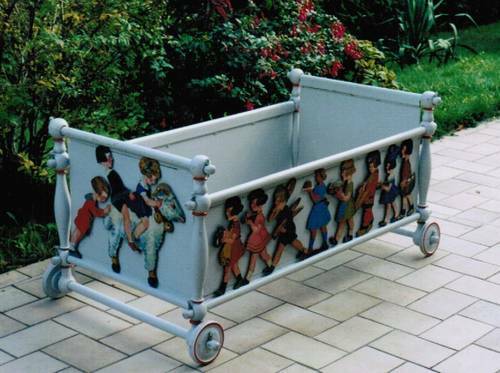 It is in excellent condition throughout and rests on four wheels with polychromed children in wood applied to all sides. The year says 1909, probably because Jean Bugatti was born in 1909, but he was born in Cologne, and there was no Bugatti factory at that time. Also, the crib is not for a small baby, but more for a little boy of between 1 - 6 years or so. So, the year is probably around 1911. 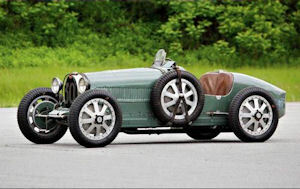 Though no Bugatti design, this is probably the cheapest way to acquire a 4-wheel vehicle built in the Bugatti factory! Oxnard, Calif. (February 10, 2014) – The Mullin Automotive Museum, a Southern California institution devoted to the preservation of French art and automobiles from the Art Deco era, today announced it will debut the completed recreation of the Bugatti 100P airplane as part of its Art of Bugatti exhibition, a tribute to the Bugatti family’s enduring genius, opening March 25, 2014. 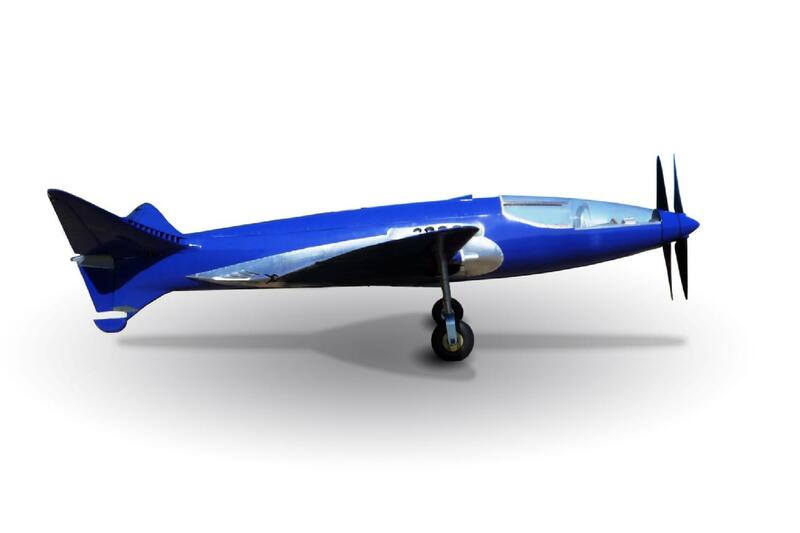 Originally designed in collaboration with Ettore Bugatti and Belgian engineer Louis de Monge, the original 1937 Bugatti 100P is considered by many to be one of the most technologically-advanced airplanes of the era. 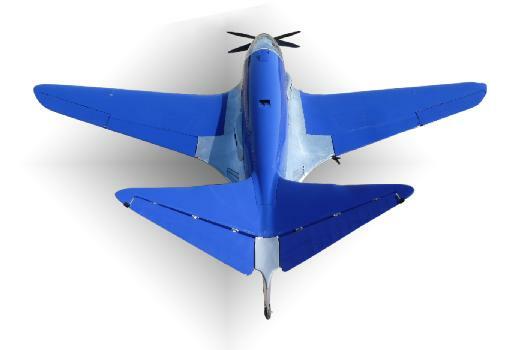 The 100P featured cutting-edge aerodynamics with forward pitched wings, a zero-drag cooling system, and computer-directed flight controls, all predating the development of the best Allied fighters of World War II. Powered by twin 450-hp engines, the plane was designed to reach speeds approaching 500mph, a feat previously only achieved by aircraft with twice the horsepower. The 100P was also much more compact than most aircraft of the era, with a wingspan of nearly 27-feet and an overall length of approximately 25.25-feet. 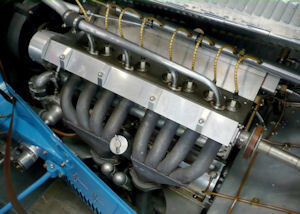 In June 1940, Bugatti stopped work on the 100P and concealed the plane to prevent its discovery by the German military. Though the plane survived the war, it was left in a condition unfit for flight. In 2009, Scott Wilson, John Lawson and Simon Birney of Le Reve Blue began construction on the first ever recreation of the Bugatti 100P. 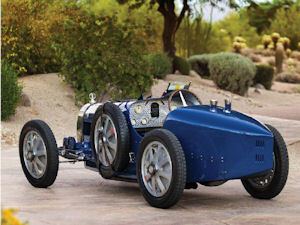 Handcrafted using largely the same materials and processes as the original, the recreation is dimensionally and aerodynamically identical to the original plane and includes elements of the five patents that Bugatti was originally awarded for the 100P. The recreation was teased as under construction at AirVenture in Oshkosh, Wis. in 2011, but will be seen as completed for the first time at the Mullin Automotive Museum, beginning in March 2014. 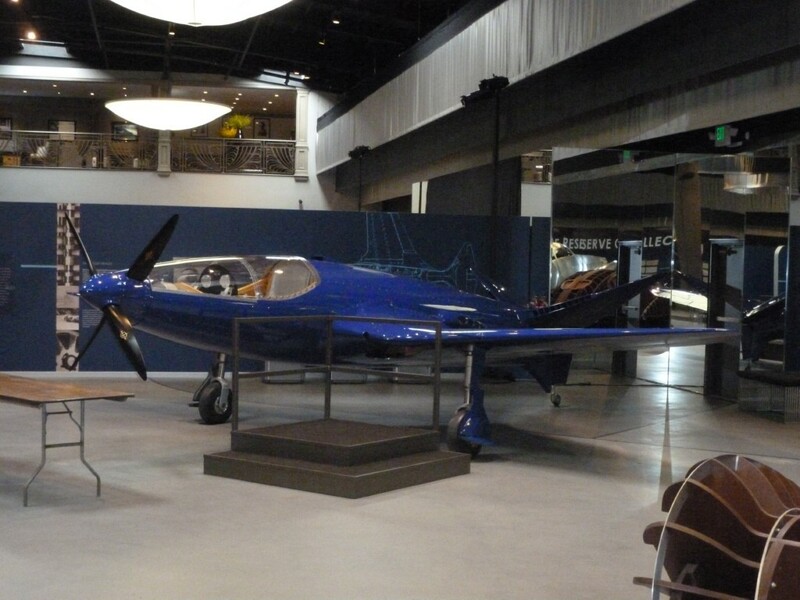 The Bugatti 100P aircraft will be on display among the largest assembled collection of Bugatti artifacts and automobiles at the Art of Bugatti exhibition, opening March 2014. 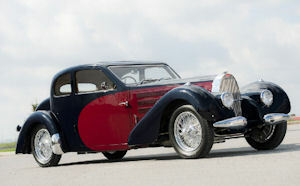 For further information on the Art of Bugatti at the Mullin Automotive Museum, please log onto www.mullinautomotivemuseum.com. 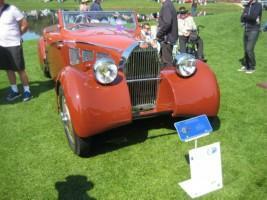 The Club Bugatti France is organising, in collaboration with Album (Alfa Bugatti Meeting) a rallye in Baie de Somme . 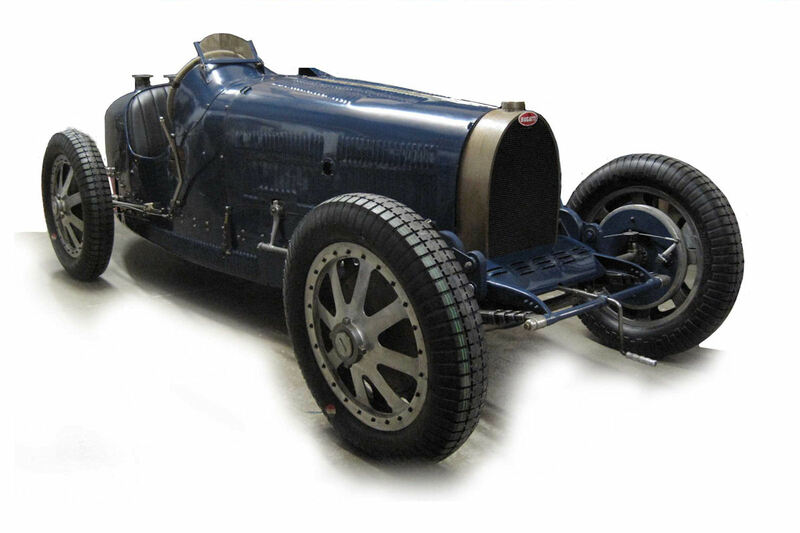 This meeting will take place from 29th May to 1st June 2014 and will be dedicated to Bugatti Type 35, 37 and 51. 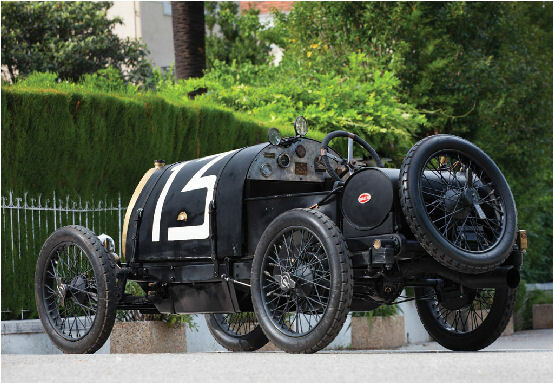 Depending on the number of entrants, we will be able to accept Type 45, 54 and 59 which represents the lastest GP Bugatti before WWII. 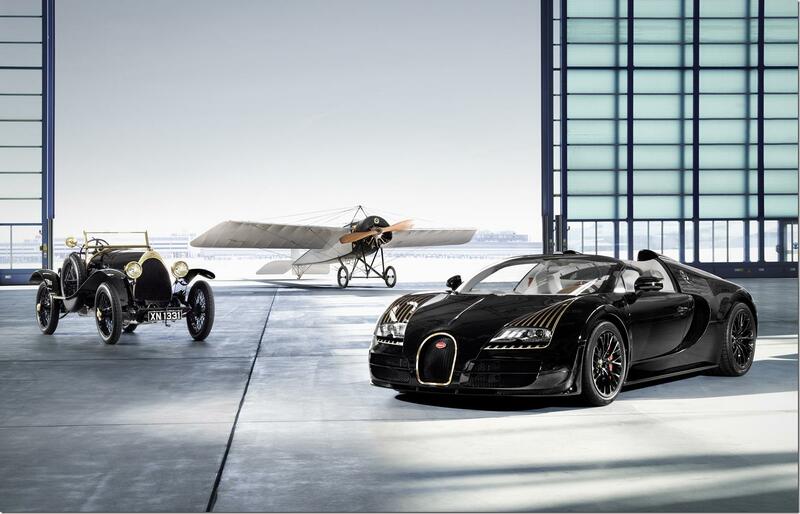 As many friends of the Bugatti scene already know, the International Bugatti Meeting in Germany 201 will be held from June 3 to 8, 2014 in Bavaria. 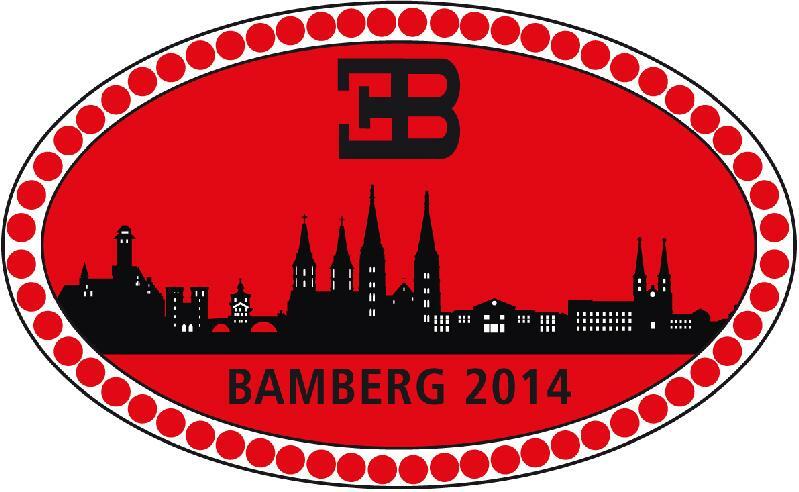 On the magnificent background of the UNESCO world heritage site of the 1000 year-old imperial cathedral city of Bamberg the Bugatti will start to extensive trips around the historic region of Upper Franconia. Because of its forests, ranges of hills and valleys laced with its castles, chateaus, churches and monasteries and picturesque rows of houses this landscape is especially appealing. The International Bugatti Meeting in Germany will be framed by a varied cultural program that leaves time for friendly, relaxed get-togethers with like-minded people. The Bugatti Club Deutschland is pleased with the already obvious great interest and is looking forward to a good attendance. 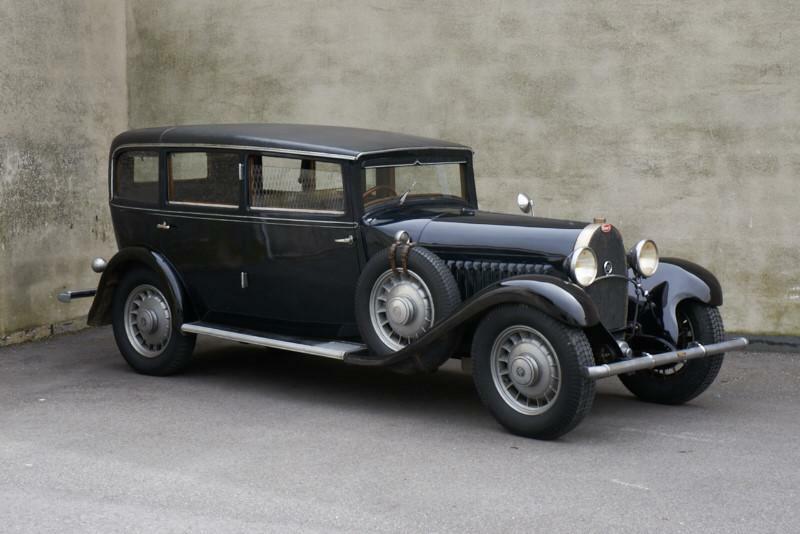 The body is an extremely rare limousine and probably the only one with division. Presented in a very good original condition. The estimate is 150.000 to 250.000 euros. REMBRANDT BUGATTI (1884–1916) was one of the most remarkable and artistically independent sculptors of the first decade of the 20th century. 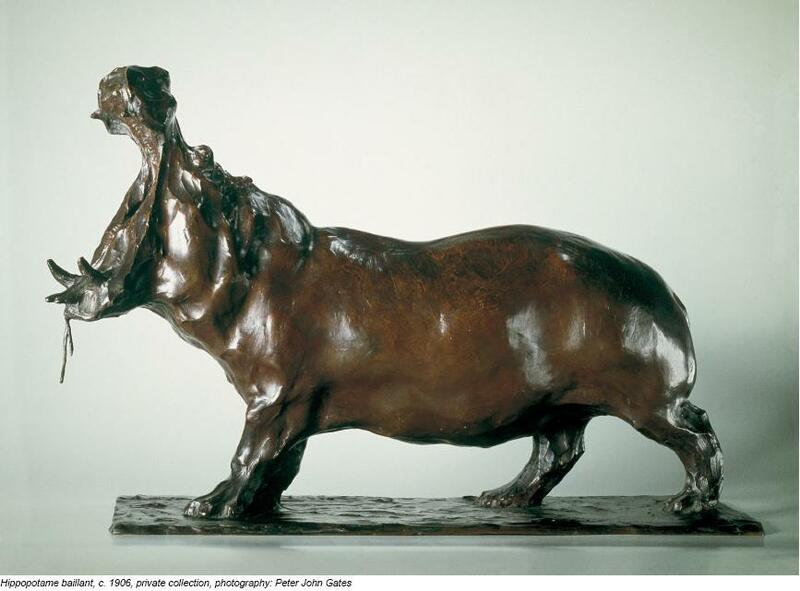 In his short life he produced more than 300 bronze sculptures, an oeuvre which is unparalleled for descriptive intensity and diversity of form and subject. 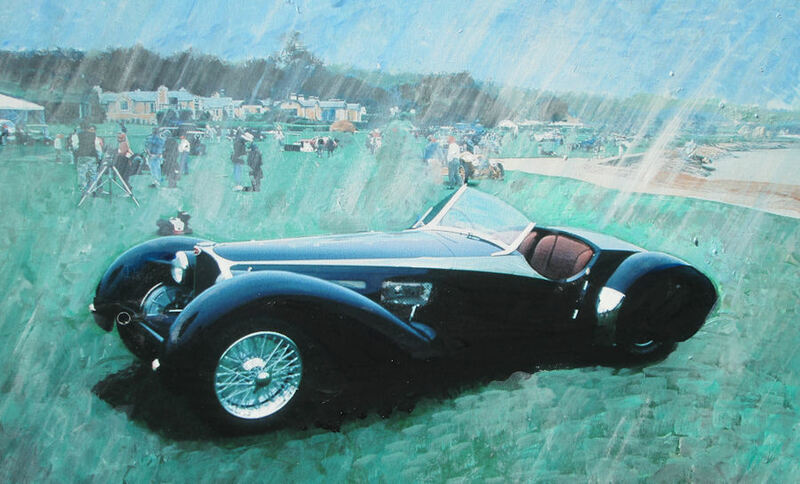 Bugatti had an extraordinary sense for the ‘right’ moment, and his accurate observation and profound intuition lend great immediacy and authenticity to his works. From the start, Bugatti focused on the representation of animals. While he depicted domestic animals such as cows, horses or dogs at the beginning, he later modelled more exotic subjects like panthers, yaks, tapirs, anteaters or marabous. After his tragic death his brother Ettore posthumously chose an elephant sculpture as the hood ornament of his legendary Bugatti Royale model. In the first solo exhibition of Bugatti’s work in Germany from March 28 – July 27, 2014, the Alte Nationalgalerie (Old National Gallery) Berlin will present around 80 of Bugatti’s sculptures throughout its entire building, vividly demonstrating how Bugatti’s work is embedded in the art of the 19th and early 20th century. This will be an one time opportunity to rediscover one of Europes most remarkable artists. 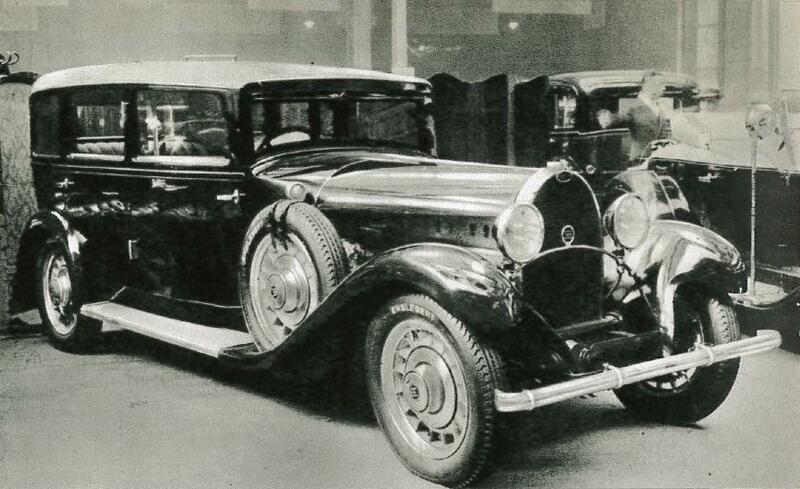 Please click here for a small pdf presentation on the life and work of Rembrandt Bugatti. 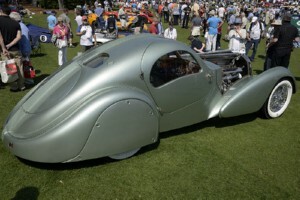 on the occasion of the Louis Vuiton Classic Show Londen june 2002. 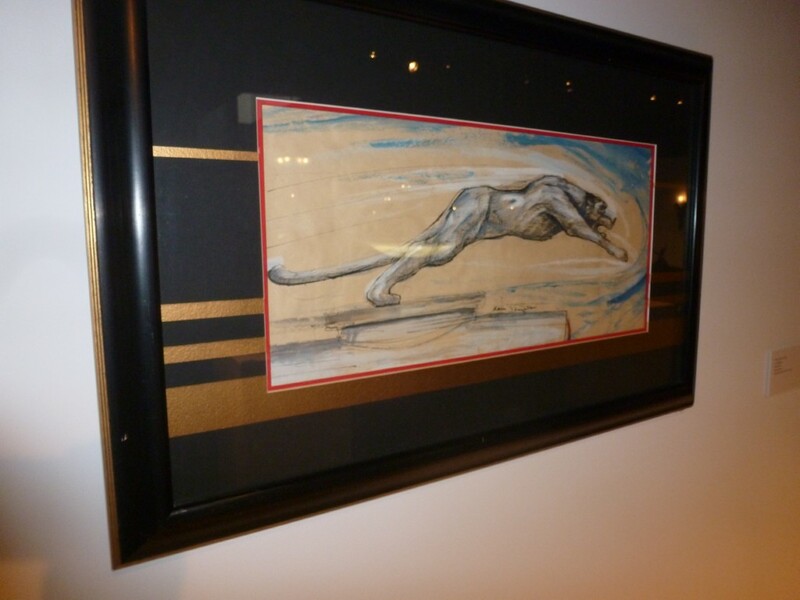 One of the Gouaches made by Pierre Dumont, as most of us are well familiar with through his book. I heard at Retromobile that the T37/35B was sold to a man from Japan, who had never even seen, let alone driven, a Bugatti before in his life! He bought it just because he liked how it looked! February 9, 2014 a mistery at Auction ?? On Thursday, November 21, RM Auctions and Sotheby's combined their considerable resources to present "Art of the Automobile" at Sotheby's headquarters in New York. Four early 20th Century automotive posters, one bronze sculpture, two motorcycles, a child-size Ferrari TR250, a spectacular horse drawn carriage called a Brewster Park Drag, and 31 cars were offered for sale, all of them on view since the preceding Monday. 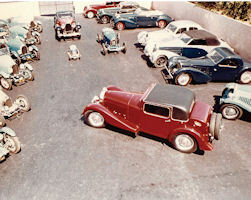 Most of the cars were newly over-restored, even those said to have been in excellent original condition prior to the restorations. Several records were set, resulting in a total of more than $63 million. Only one Bugatti was present, a Veyron Nuit Bleu. 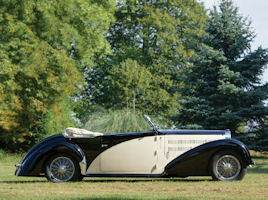 The auctioneer, Max Girardo of RM Auctions, announced the opening bid of $1,000,000- for the Veyron. Someone immediately bid $2.1 million, ignoring any rational incremental bids in between, and the car sold at that price. The room was hushed. Girardo was speechless. What had happened? A wild and effective jump bid? A "plant" instructed not to let the car go for less than $2.1 who had misunderstood his instructions and bid too soon? Perhaps somebody has an explanation? Bugatti will build neither a ‘SuperVeyron' to top the 1183bhp SuperSport, nor a production version of the 2009 Galibier concept, company boss Dr Wolfgang Schreiber has exclusively revealed to Top Gear. Despite rumours of a yet-more-powerful, yet-faster Veyron to send the epochal hypercar into retirement with a bang, Dr Schreiber reckons 268mph is, quite frankly, enough. "We will not produce a ‘SuperVeyron' or Veyron Plus, definitely," said the Bugatti president, who who was key in the development of the Veyron back in the early Noughties as Bugatti's Technical Director. "There will be no more power. 1200PS is enough for the chapter of Veyron and its derivatives." Sounds pretty definitive to us. And Schreiber is equally clear about the fate of the opulent Galibier fastback, explaining it would dilute the Bugatti philosophy. "We have talked many, many times about the Galibier, but this car will not come because [...] it would confuse our customers. 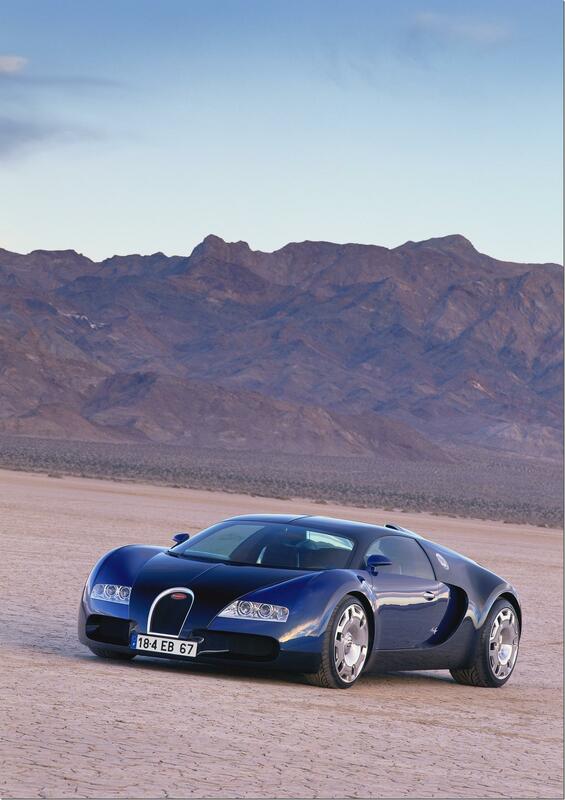 With the Veyron, we placed Bugatti on top of all super-sportscar brands in the whole world. Everyone knows that Bugatti is the ultimate super sportscar. It's easier for current owners, and others who are interested, to understand if we do something similar to the Veyron [next]. And that is what we will do. 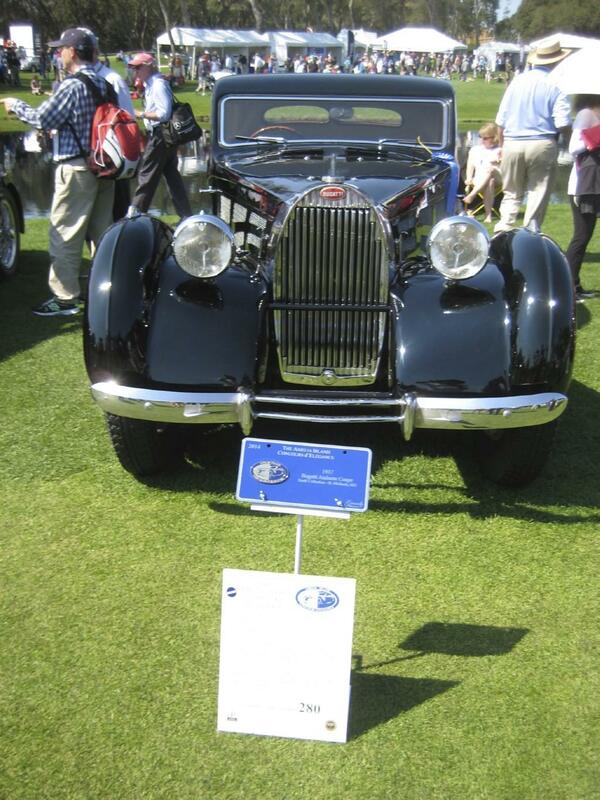 There will not be a four-door Bugatti." So the next Bugatti will follow firmly in the footsteps of the current Veyron. But, of course, the current hyper-thing battlefield is very different from that which greeted the original. In the last year, McLaren's P1 and the Porsche 918 have - without pitching for the Veyron's production speed crown - pushed the hypercar handling envelope, with the LaFerrari soon to join the fray, too. So what's the brief for the next Veyron? 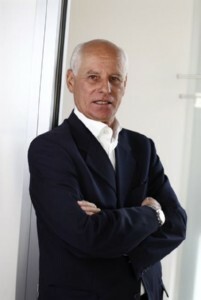 Forget McLaren, Porsche and Ferrari, says Dr Schreiber. All the next Veyron has to worry about is... the current one. 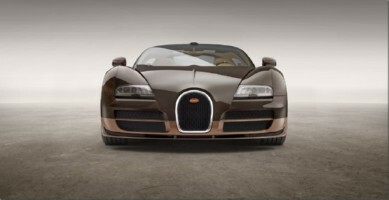 "It has to redefine the benchmarks," he states firmly, "and the benchmark today is still the current Veyron. We are already working on it." Will the Veyron, like the McLaren, Porsche and Ferrari, utilise hybrid power in pursuit of ultimate speed? "Maybe," smiles Dr Schreiber. "But it's too early to open the door and show you what we have planned. For now we have to keep the focus on the current Veyron, and help people to understand that this really is the last opportunity to get the car, which will have run for ten years from 2005-2015. Then we will close this chapter and open another one." Dr Schreiber confirmed that just 43 of the Veyron's total 450-car production run remain up for grabs, including the remaining three of Bugatti's six-strong ‘Legends' series. "The 300 coupés have sold out. We announced we would only make 150 roadsters, and we only have 43 left. People are becoming increasingly conscious that their opportunity to buy a Veyron is running out..."
Now the New Zealand Bugatti Club is organising an International Rally from Sunday, 16 February to Tuesday, 4 March 2014, the Bugatti Club Australia has been requested by a number of entrants from Europe to run an event in Australia as a follow on from this. The event will start in Sydney, and tour generally north from Sydney to cover both the beautiful beach areas and the scenic mountainous and agricultural areas inland, to finish near Brisbane from where cars can be shipped home. We plan that this will be a less formal event than the usual international rallies, and that entrants will pay their way as they go, rather than paying a large entry fee which includes everything. 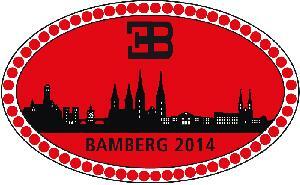 Mechanical back-up and luggage transport will be at a low level and will depend on the number of entries. Cars will need to be shipped from Christchurch, in the South Island of New Zealand, to Sydney for the start of this event. There is no regular drive on/ drive off passenger ferry between New Zealand and Australia, and it is necessary for the cars to be packed into shipping containers in Christchurch and unloaded from those containers in Sydney, where they will need customs and import clearance. Our reliable shipping advisers and customs agents tell us that we must allow 21 days from the finish of the rally in Christchurch New Zealand to the start in Sydney, to allow for all possible delays. He has been making some artwork of some of his paintings. He is doing a series of twelve pre-war French cars. 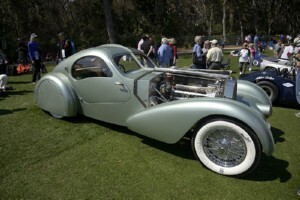 The first was a Talbot Lago. This one is a gicleee print on canvas, 20" x 30" , embellished with oil paint after it's printed , gallery wrapped. 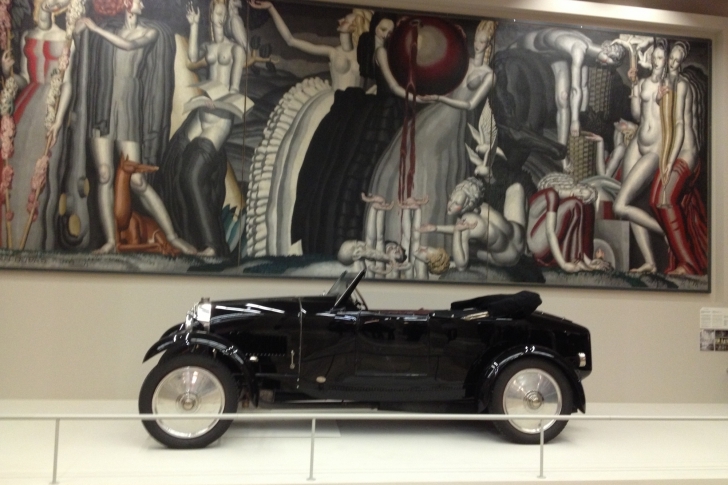 I'm not sure if it is Art Déco, but there is a Bugatti T40 GS there! 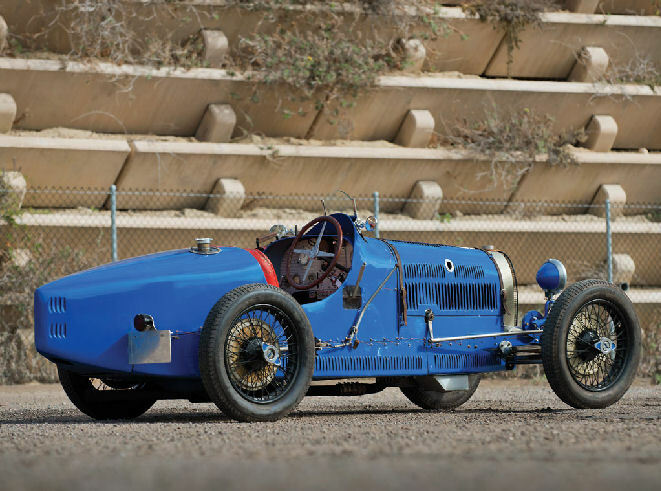 I can spoil you one of the surprises: Henrik Schou-Nielsen was last year at Retromobile with the T51 Roadster, this year he will be showing the T51 GP, which was raced by Mme Itier. 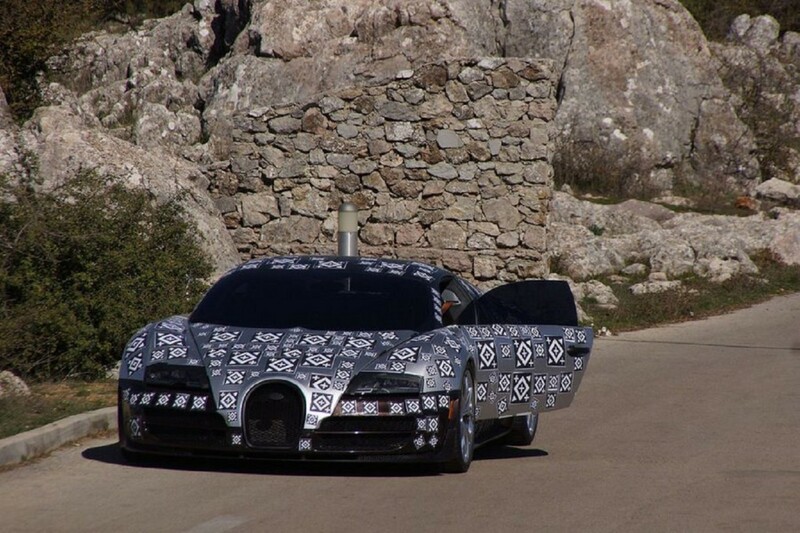 At Bugatti SAS the EB 18/4 “Veyron” design study will be on show. This is the first time that the study will be displayed at a trade fair since its unveiling at the Tokyo Motor Show in 1999. 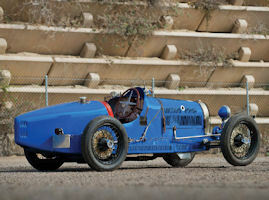 Bugatti SAS can be found in Hall 1, at stand P43. 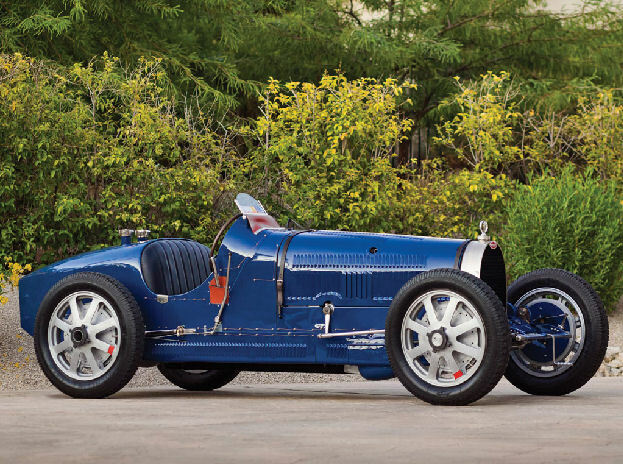 Built in France in 1929, the Bugatti 37A started life as a four-cylinder Grand Prix model used exclusively for competition. 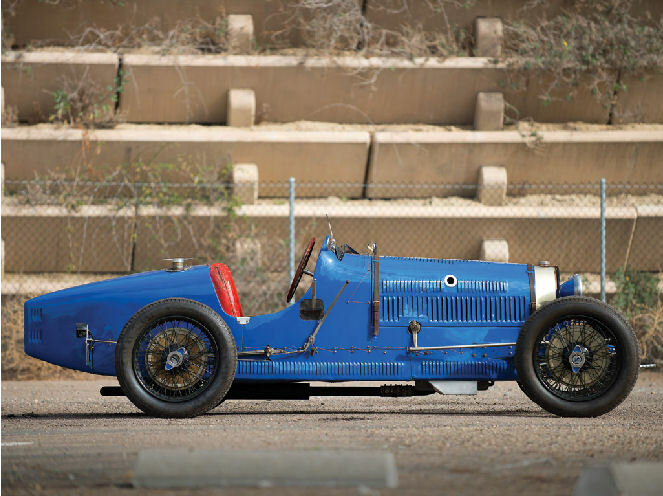 It was first owned by Briton Jack Lemon Burton – founder member of the Bugatti Owners' Club – whose father gave it to him as a 21st birthday present in 1932 and, having subsequently tuned the engine, he towed the car to races around the country. Three years later it was bought by solicitor Alan Bainton who left the engine beyond repair at a race in Brooklands in 1935. 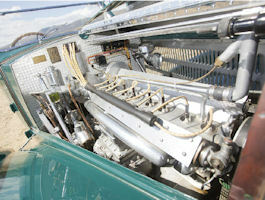 As a result his mechanic, Louis Giron, installed the engine of Bainton's Type 43 into the Type 37A, producing what was effectively a Type 35B Bugatti. Bainton was later gaoled for fraud and Lady Mary Grosvenor, daughter of the Duke of Westminster, puchased the car from Blake Brothers of Liverpool, adding to the car's colourful history. A keen racing driver, she set the ladies' Bugatti race record at Prescott in June 1947 driving Chassis 37371 with a time of 52.79 seconds - a record that stood for 35 years. 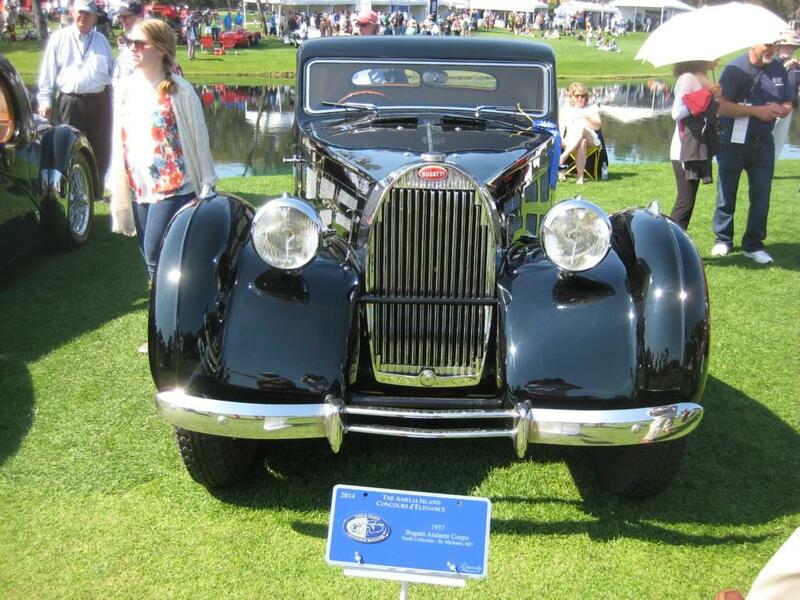 In 1948, the Bugatti was acquired once again by the Blake Brothers, who were forced to sell it four years later to Robert Estes of California when its director, Peter Reece Blake, was killed in a car crash. His death caused the British company to go out of business. 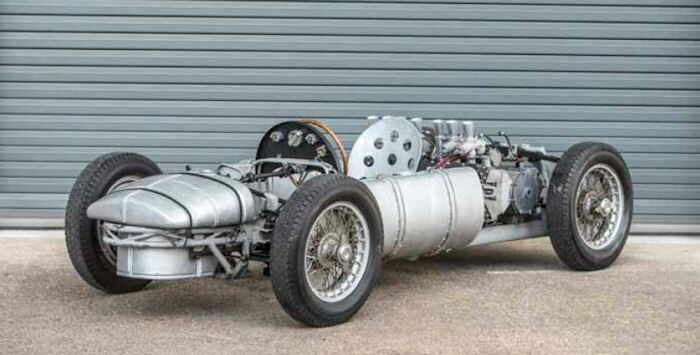 Following the tragedy of the Blake Brothers, Chassis 37371, which has an estimate of €1,500,000-1,800,000, was destined to spend the next five decades in America. There it competed in West Coast events after display at the Briggs Cunningham museum for 15 years during the 1950s and 60s and is thought to have made its last race appearance in 1977 under the ownership of the Estes family. 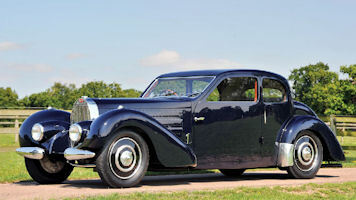 In 2007 the car was given a complete rebuild by Gentry restorations and is now in superb condition. 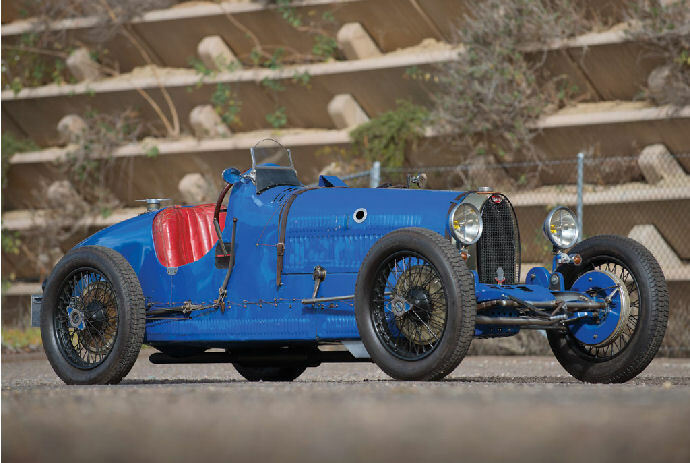 Philip Kantor, Head of Bonhams Motor Cars Europe, said: "This Bugatti has a history that is comprehensive and fascinating but, most importantly, continuous and fully documented. Owned by Jack Lemon Burton and subsequent well-known car enthusiasts, we look forward to being able to offer it at auction back on home soil in France." Visiting a lot of different locations in this wonderful country! Start in Auckland, finish in Christchurch. A world-class Concours d'Elegance of rare vintage automobiles has long been envisioned as a focal point for Arizona's famed collector-car auction week. 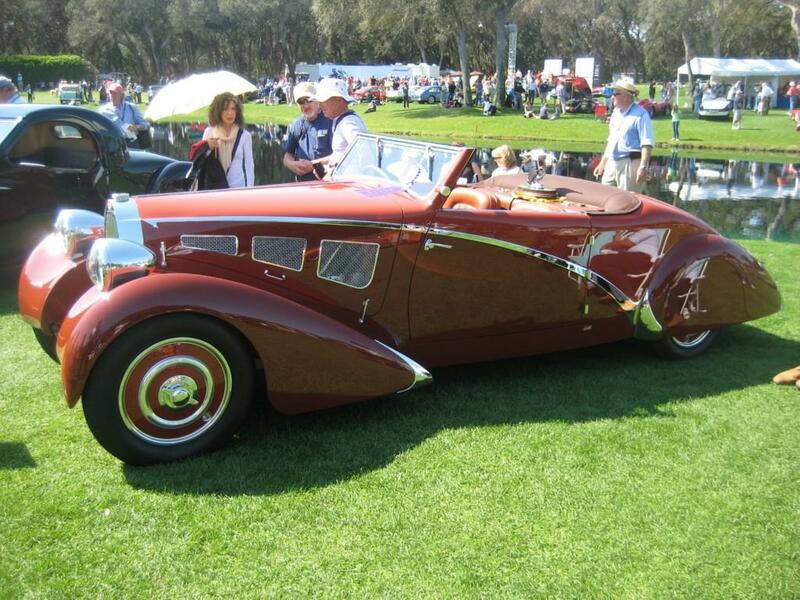 On Sunday, Jan. 12, 2014, the vision comes to life when the inaugural Arizona Concours d'Elegance starts off the week at the Arizona Biltmore Resort with a premium event of style and luxury. 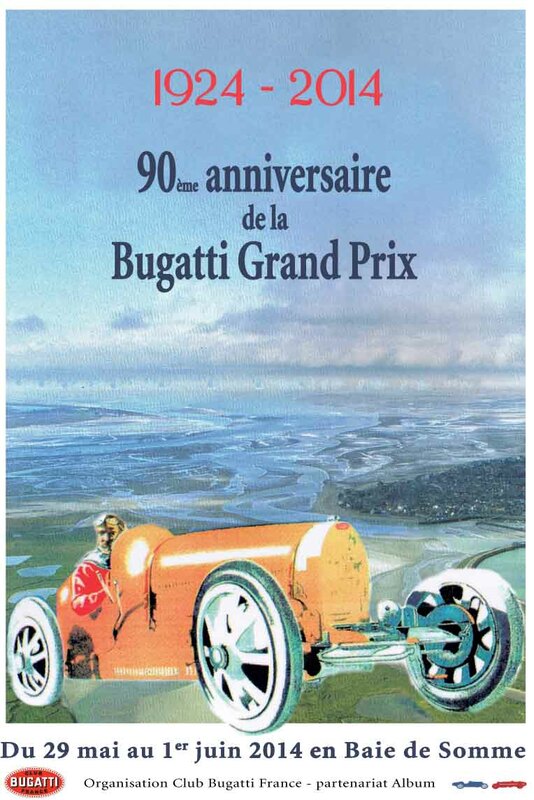 I'm not sure about which Bugattis will be there, or how many. At least one red/black Galibier!